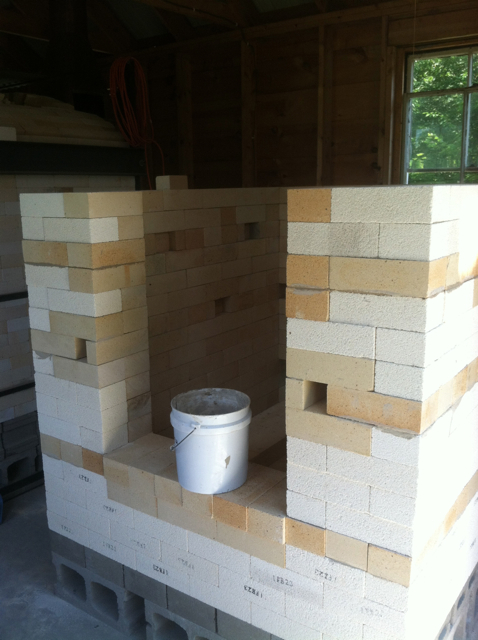 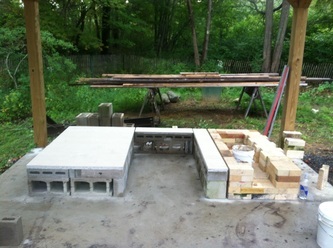 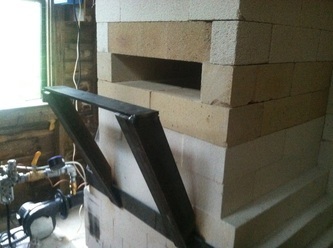 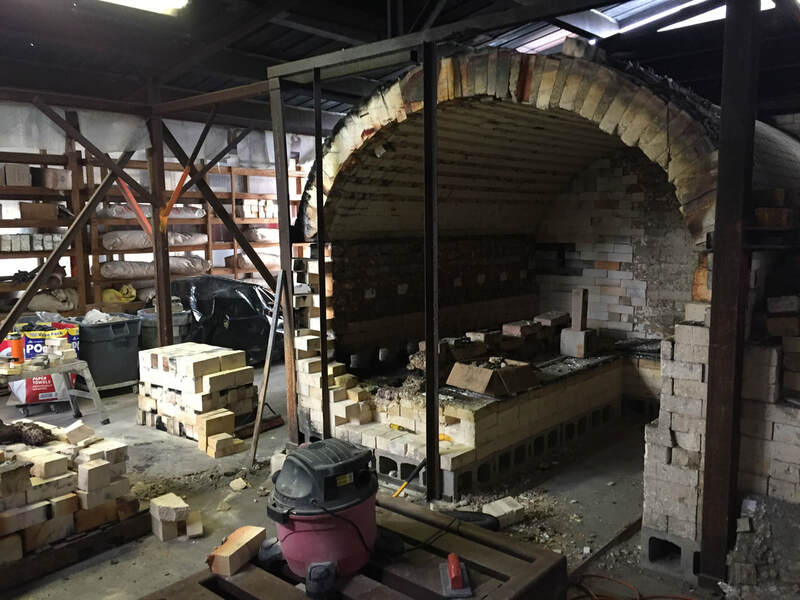 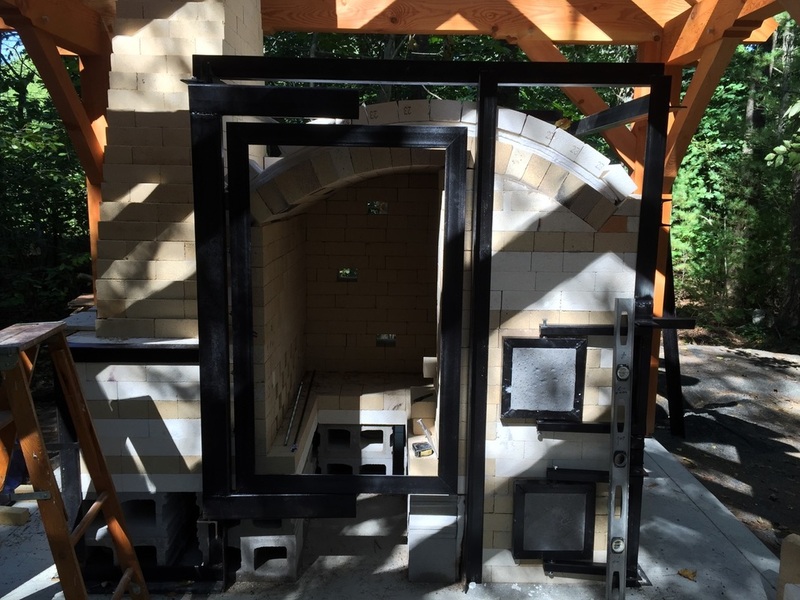 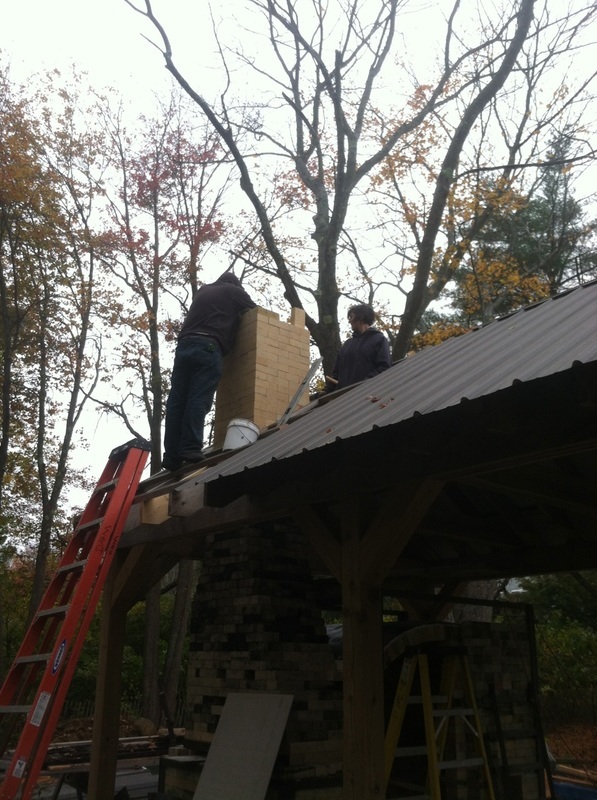 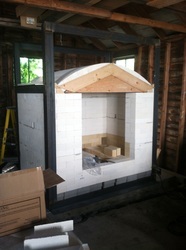 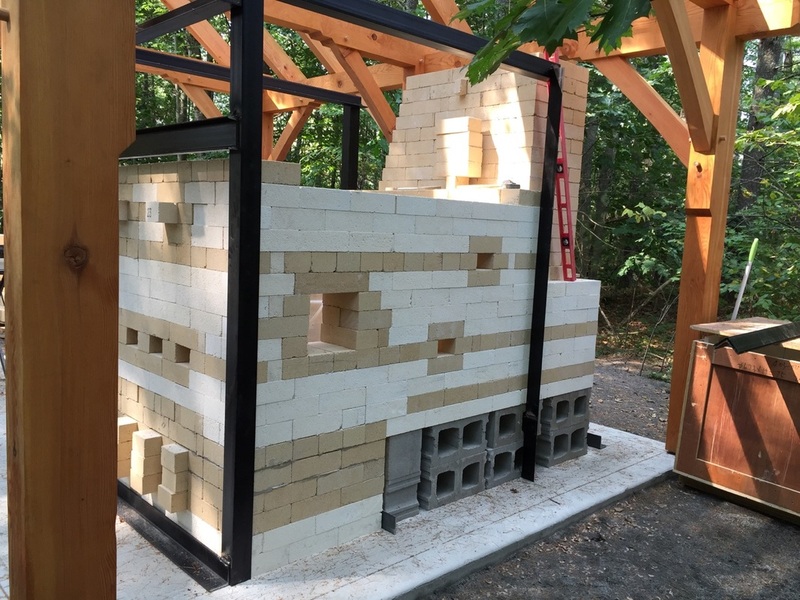 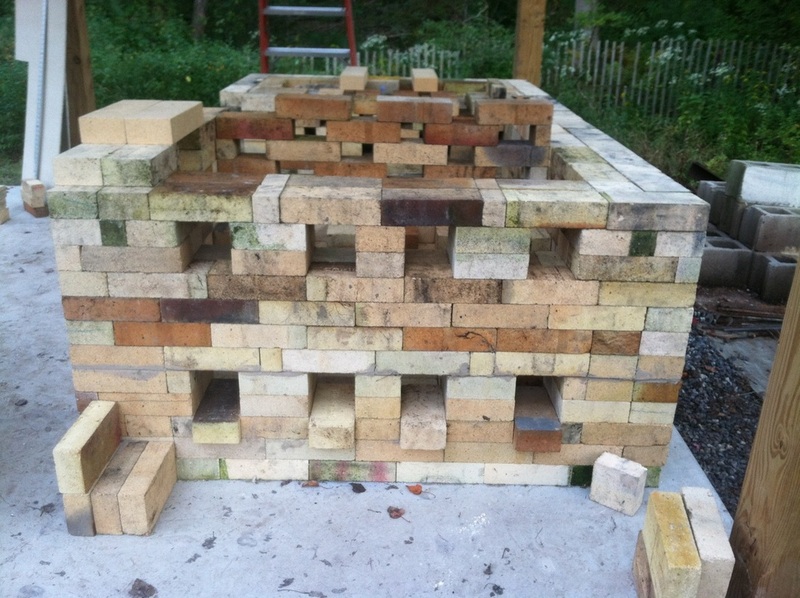 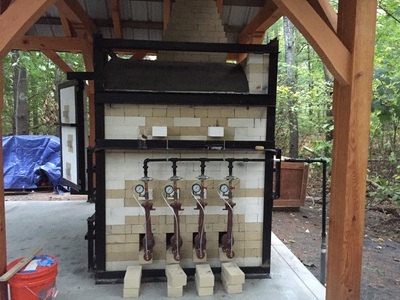 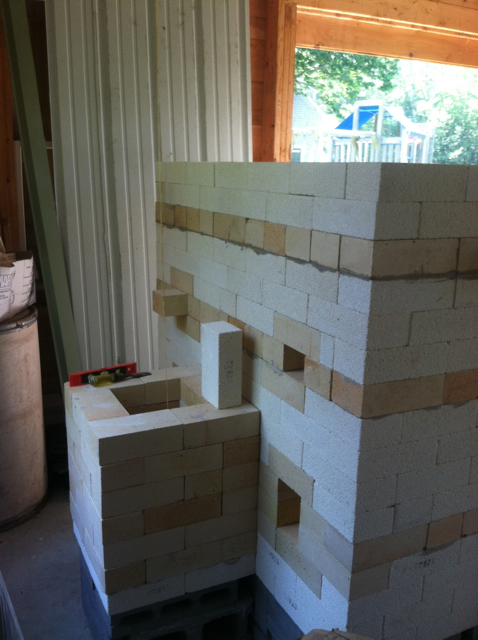 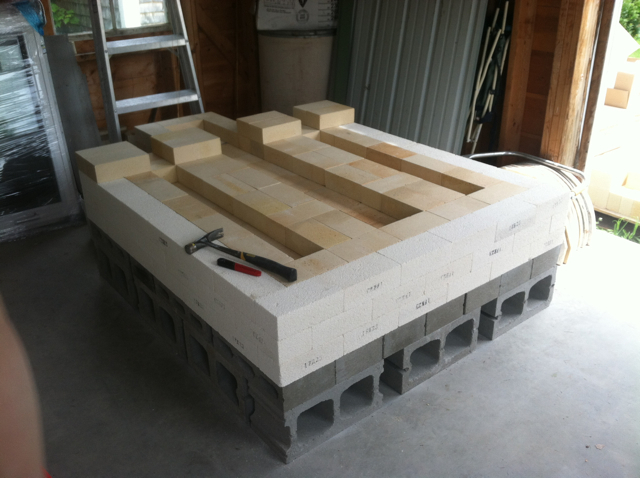 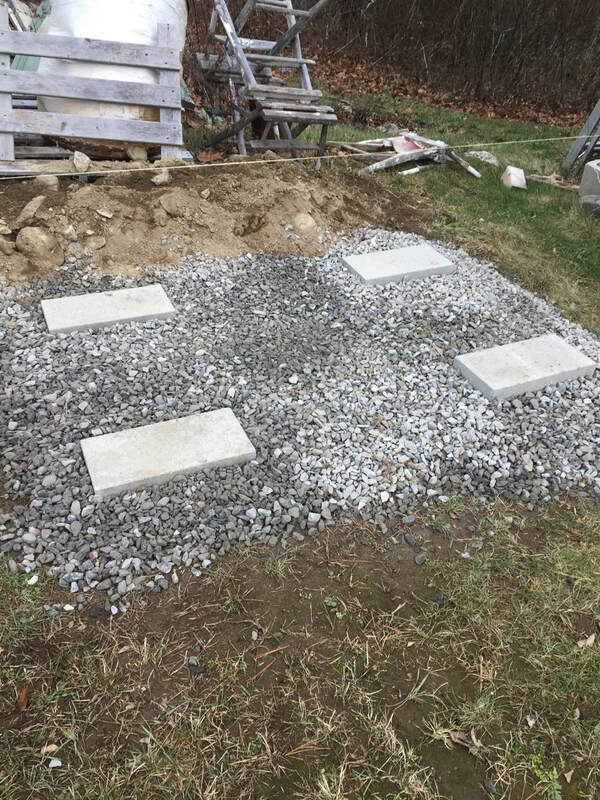 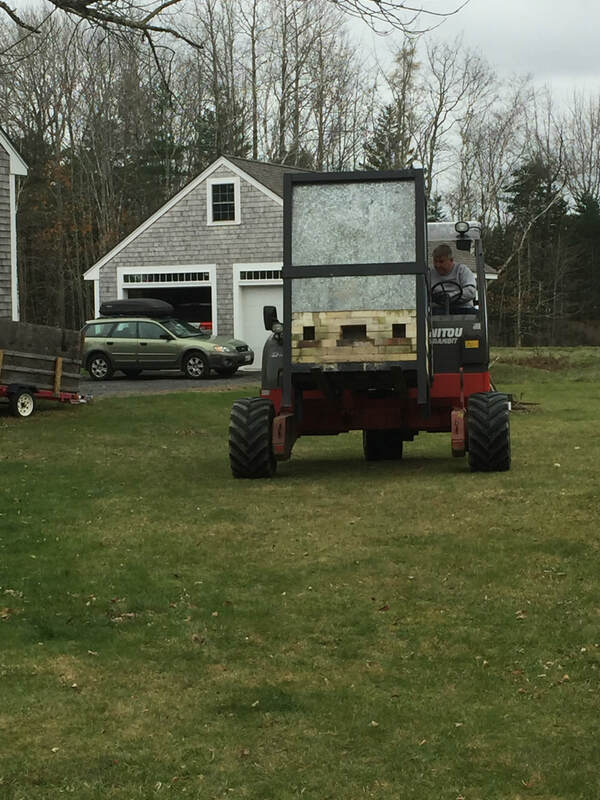 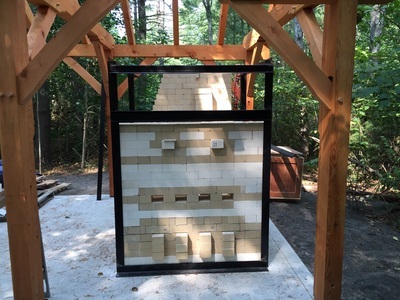 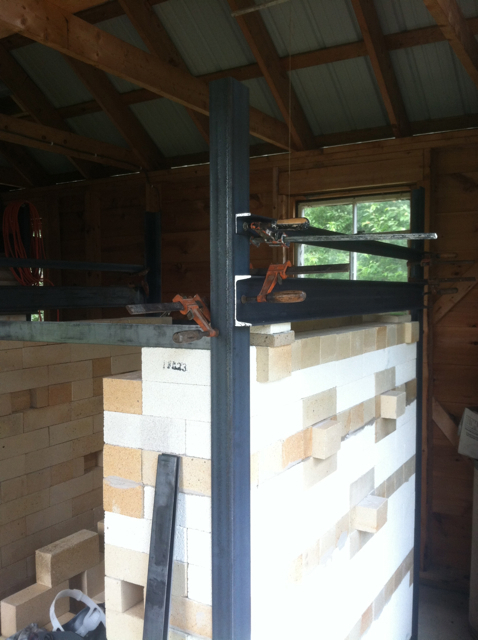 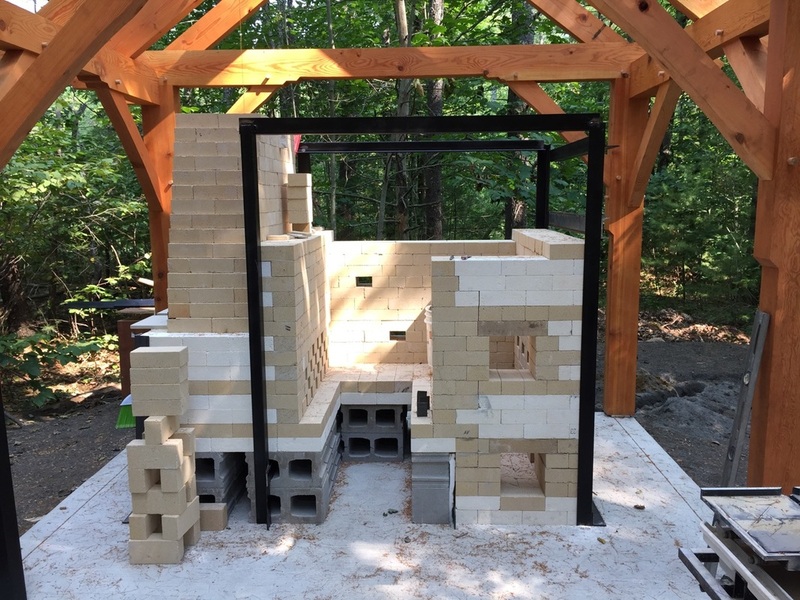 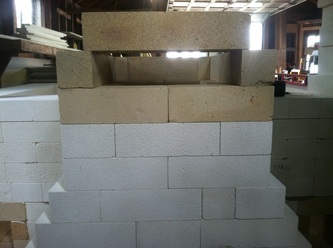 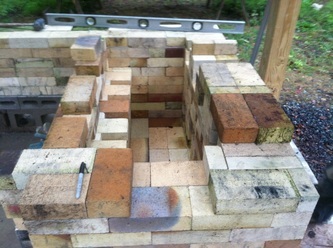 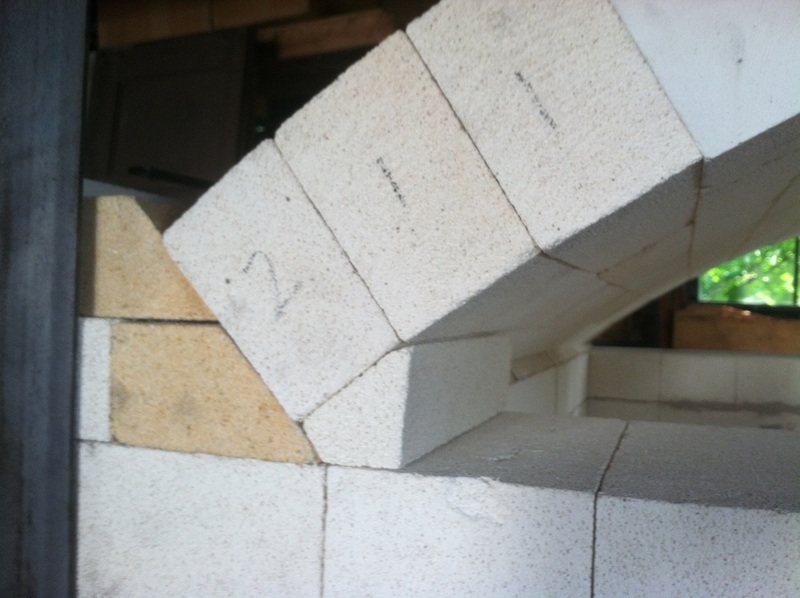 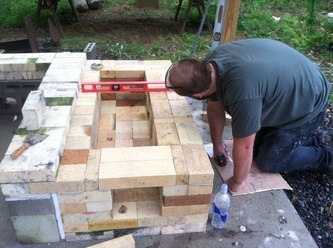 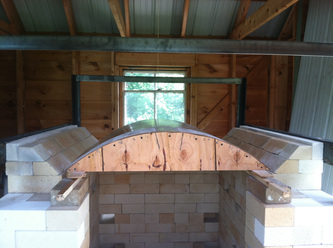 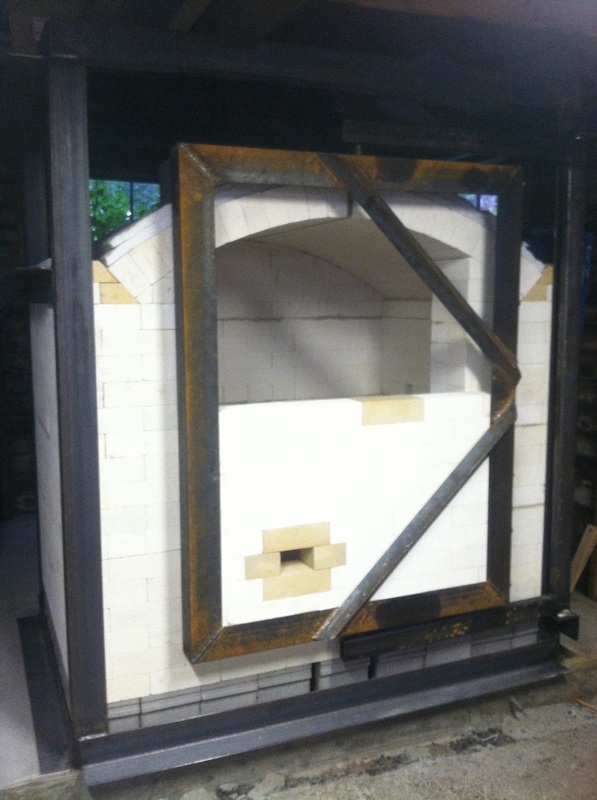 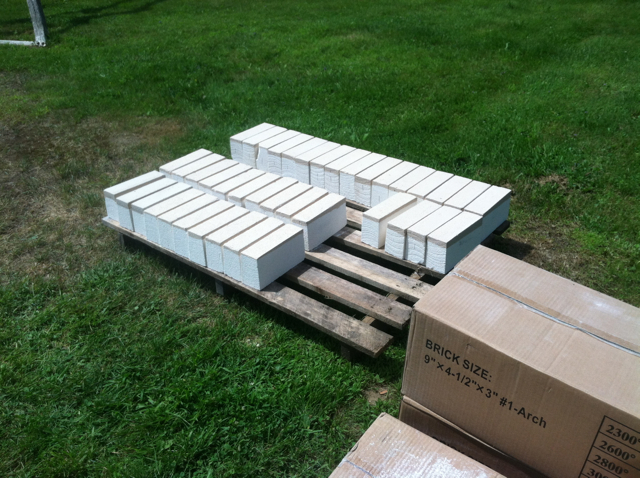 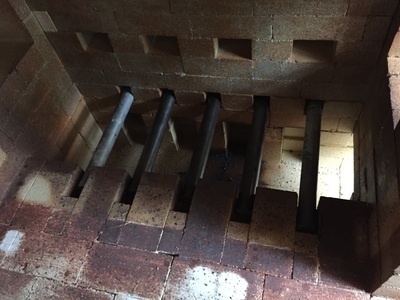 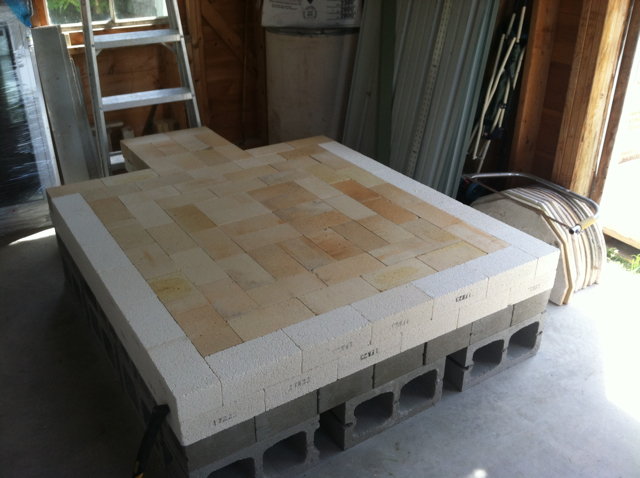 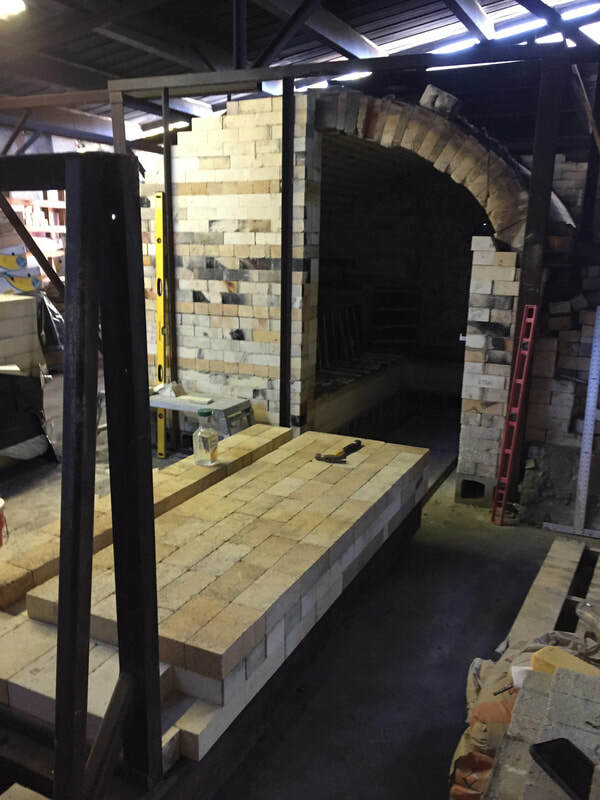 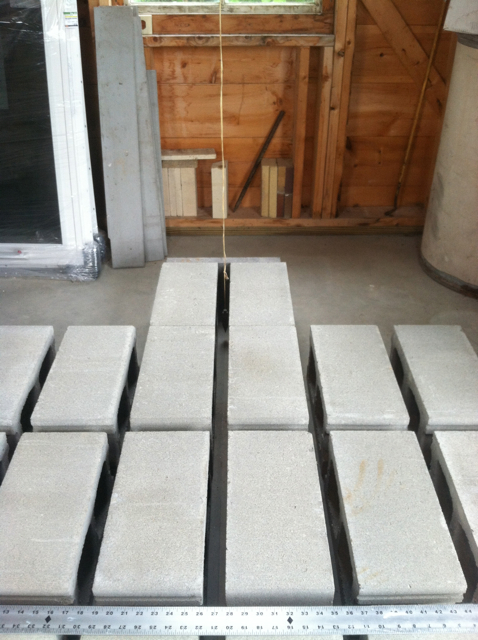 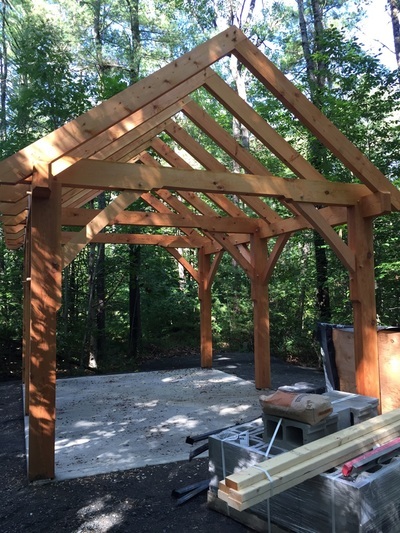 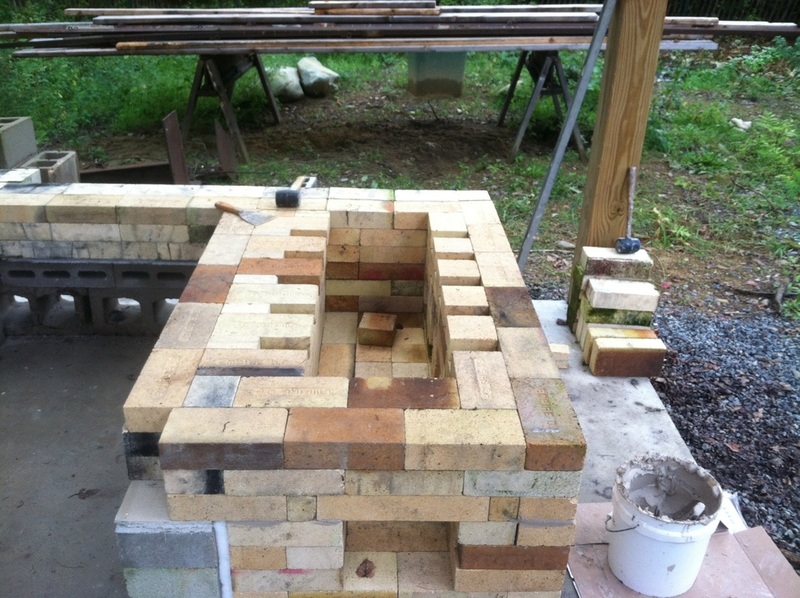 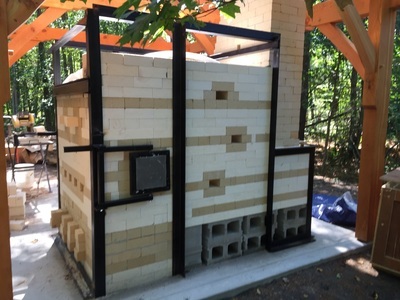 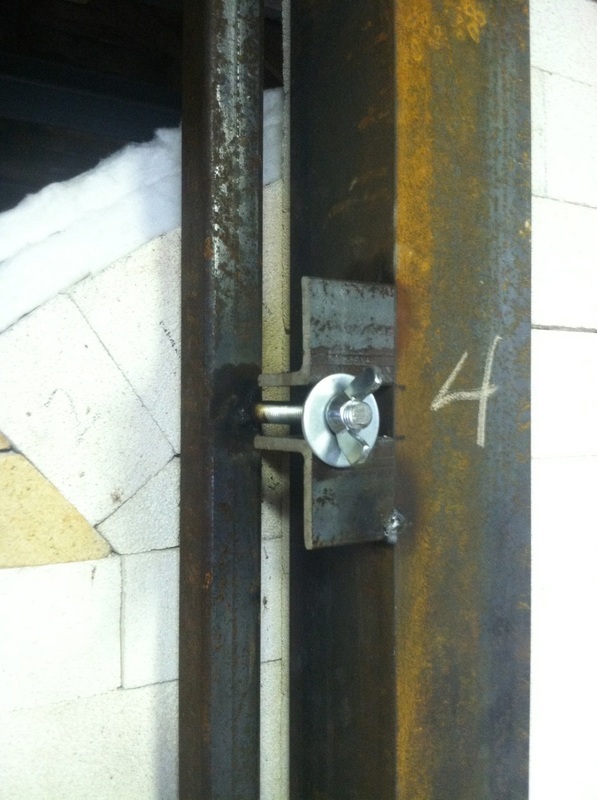 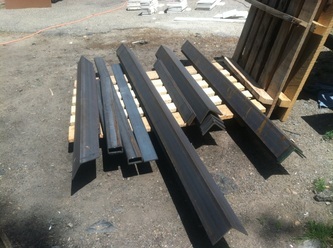 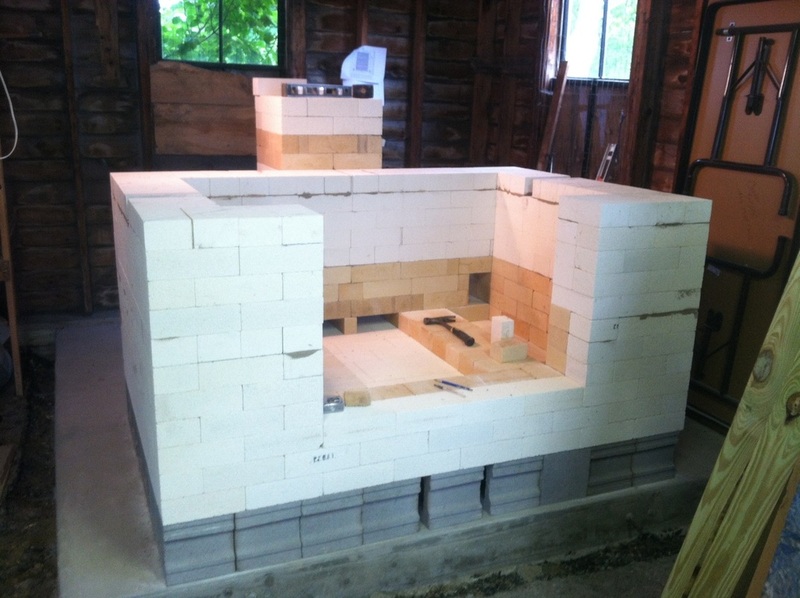 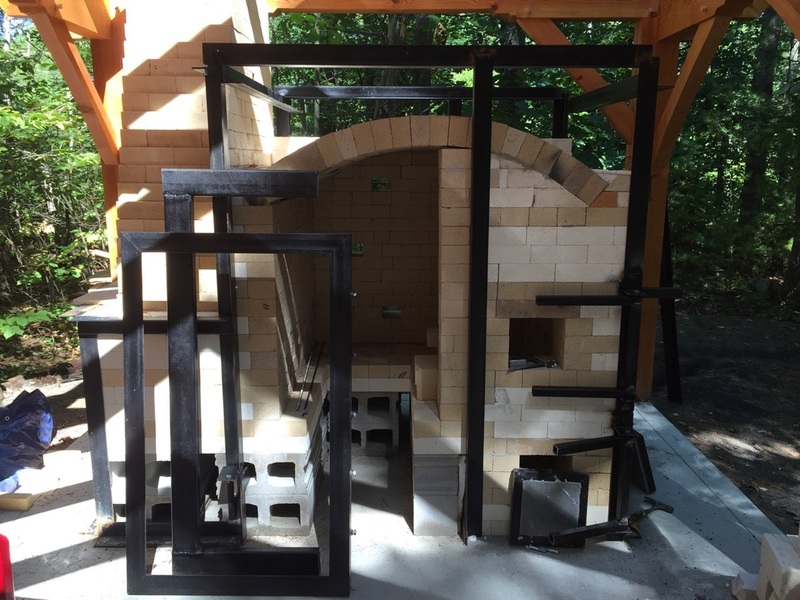 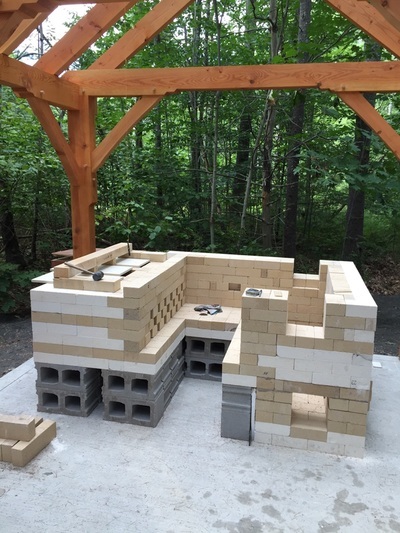 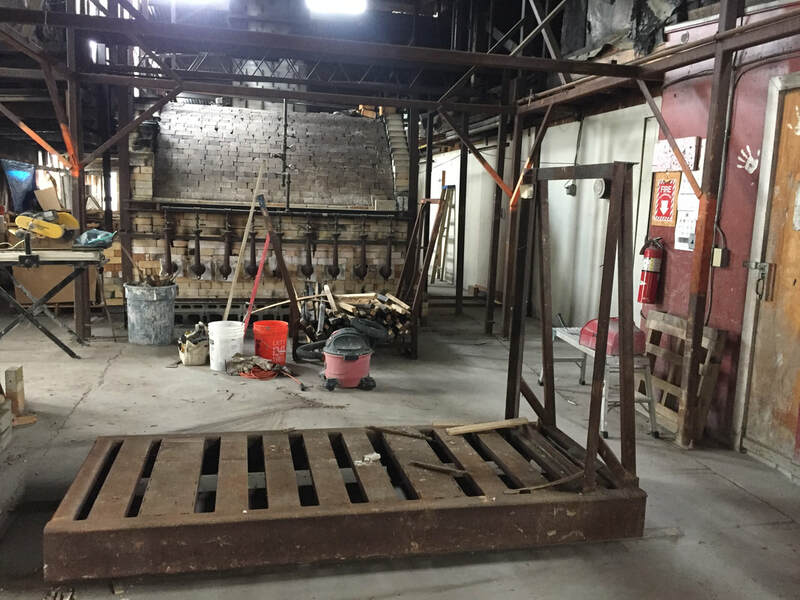 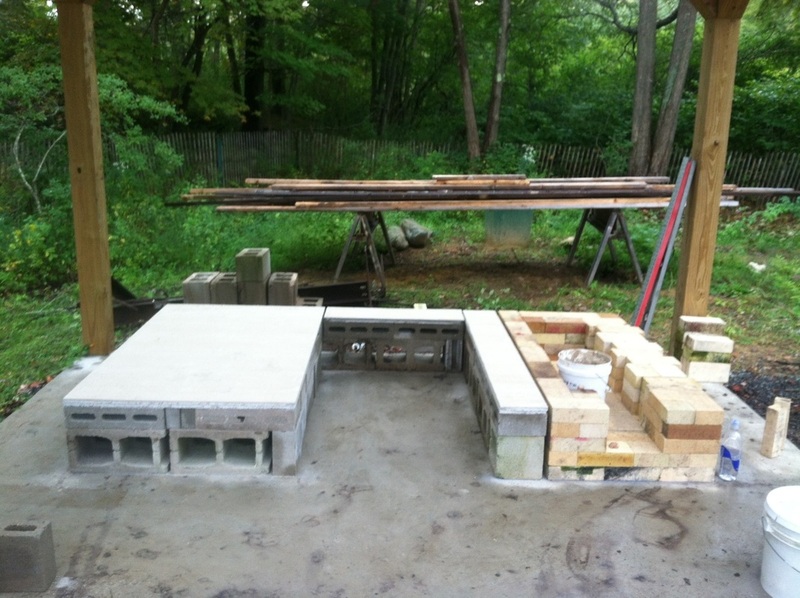 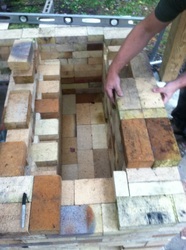 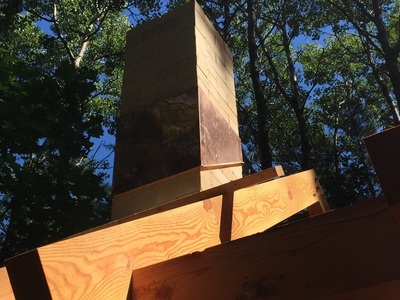 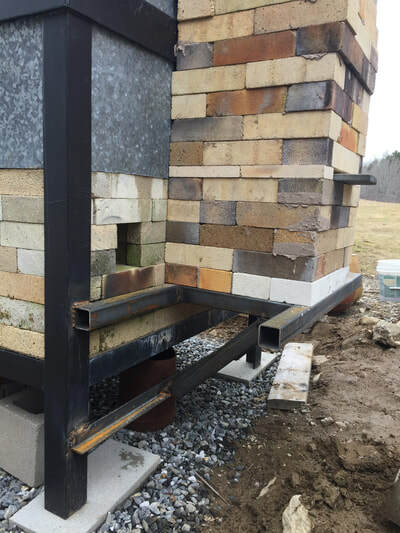 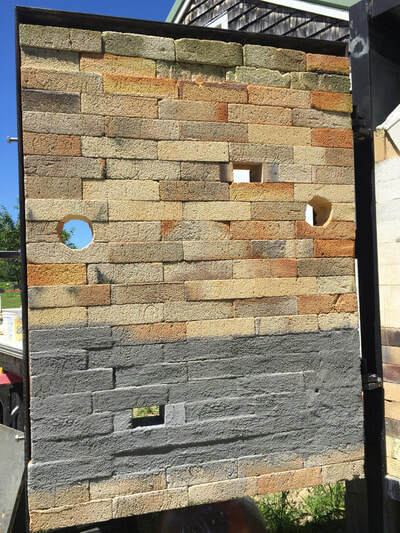 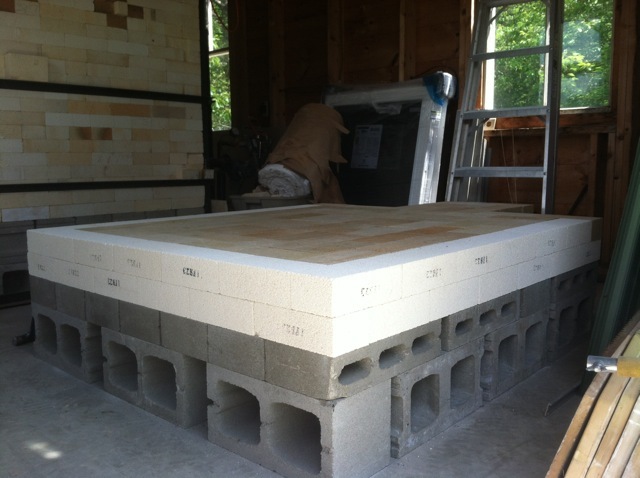 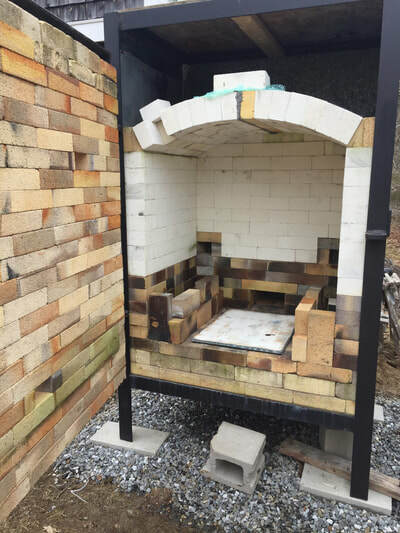 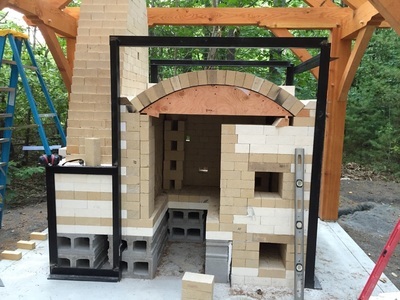 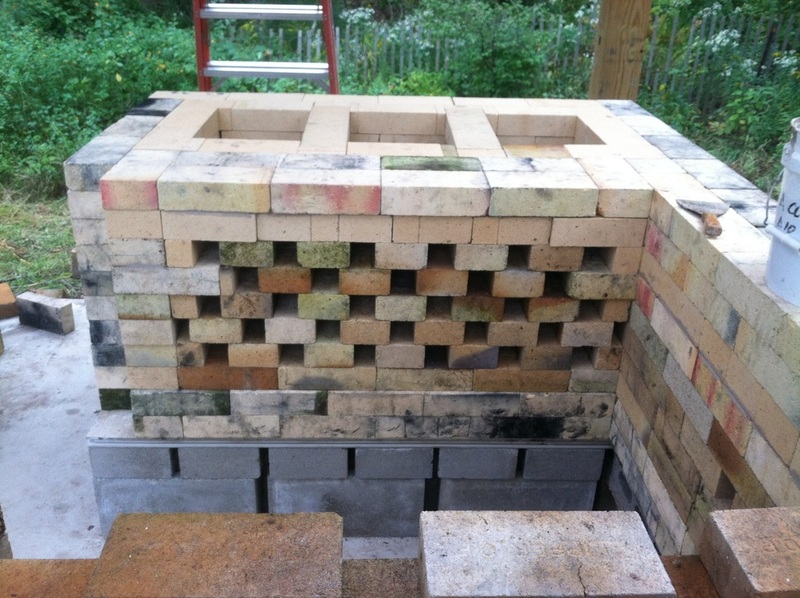 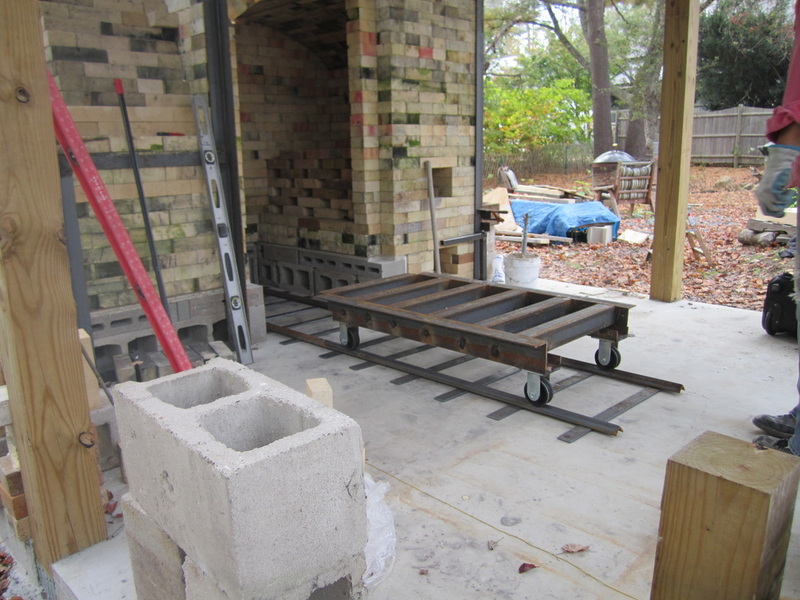 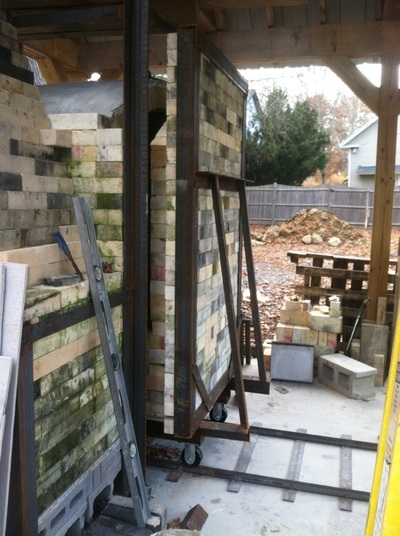 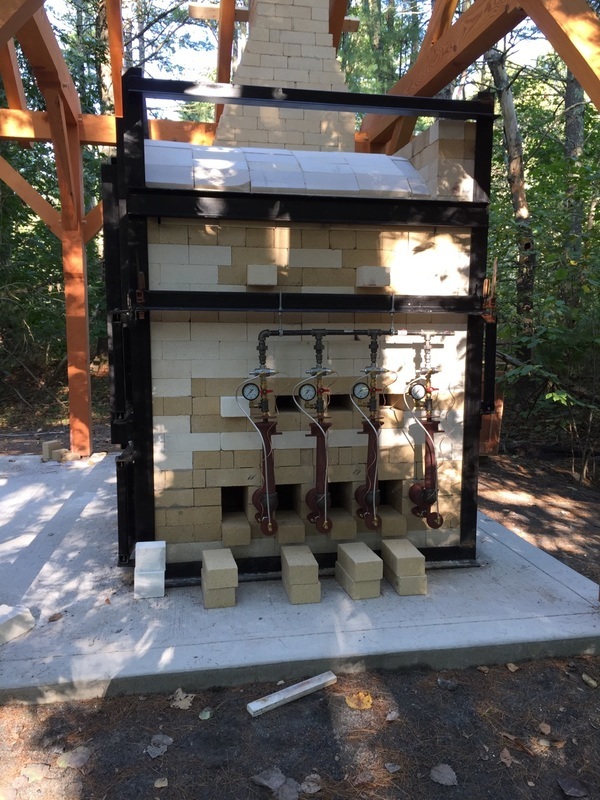 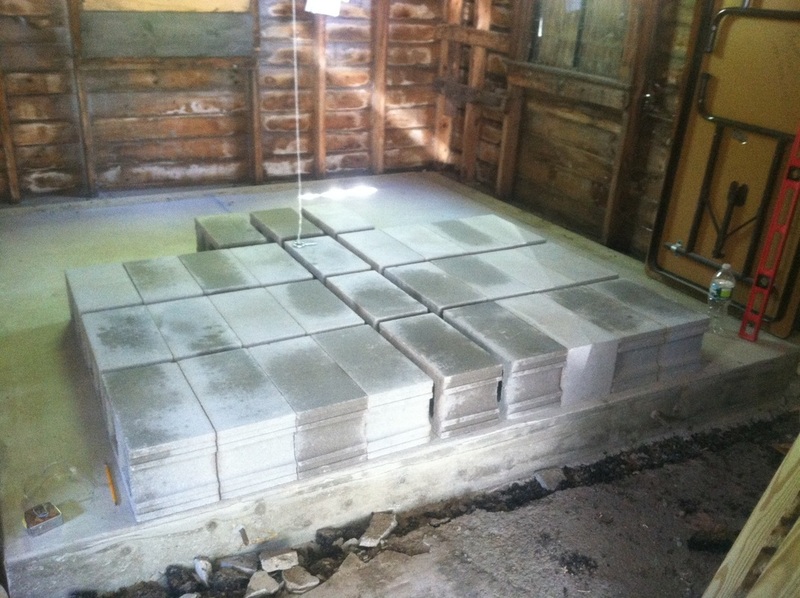 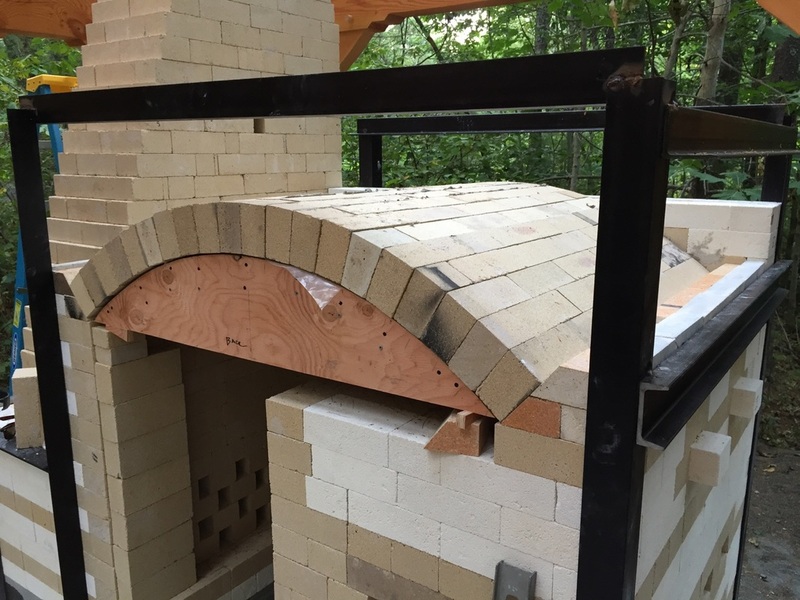 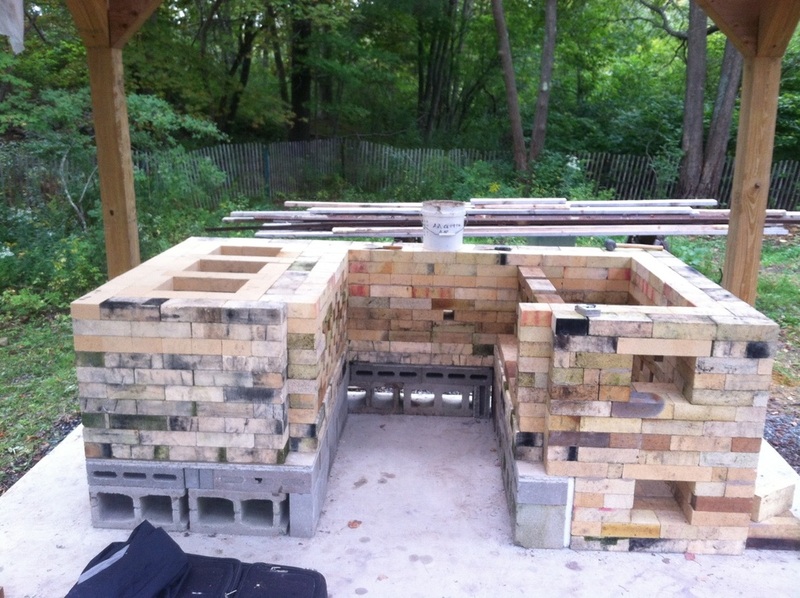 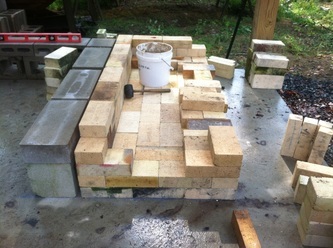 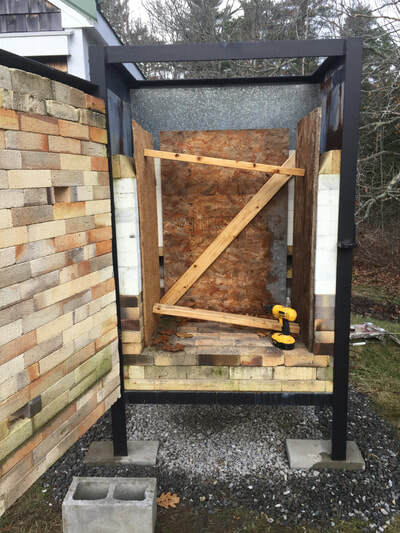 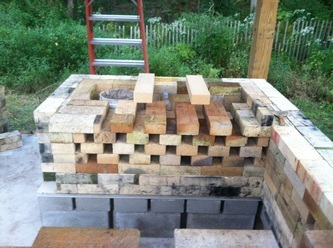 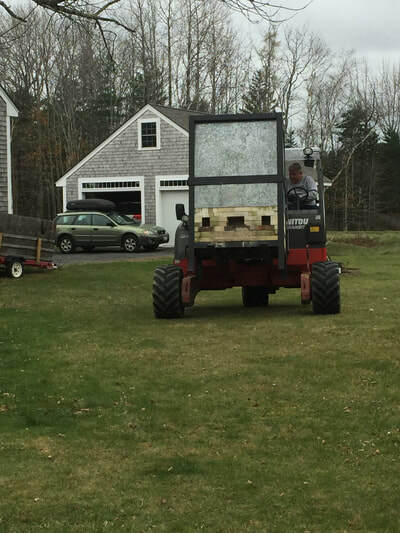 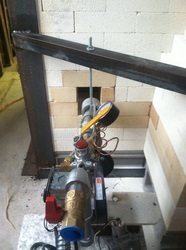 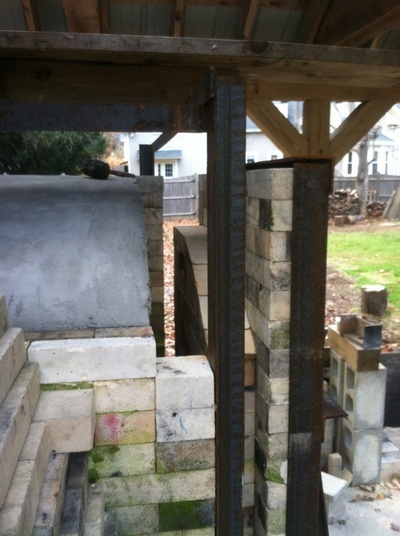 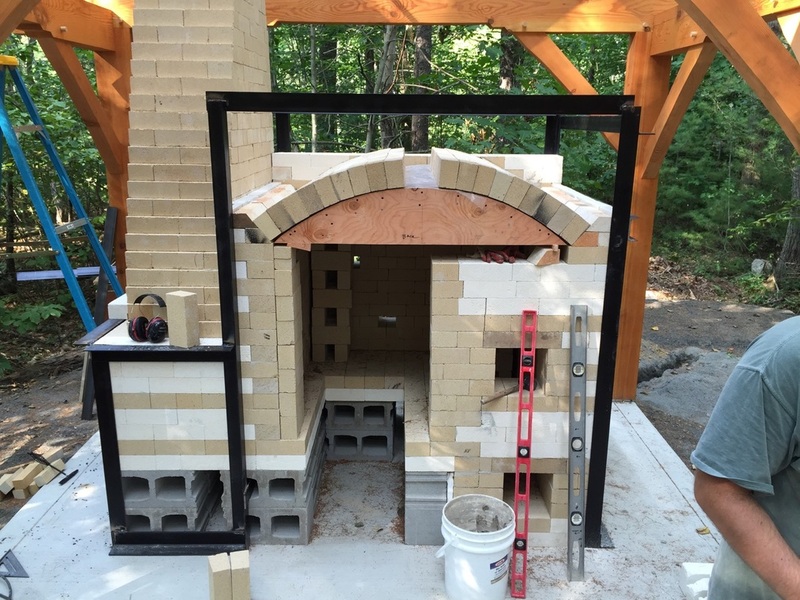 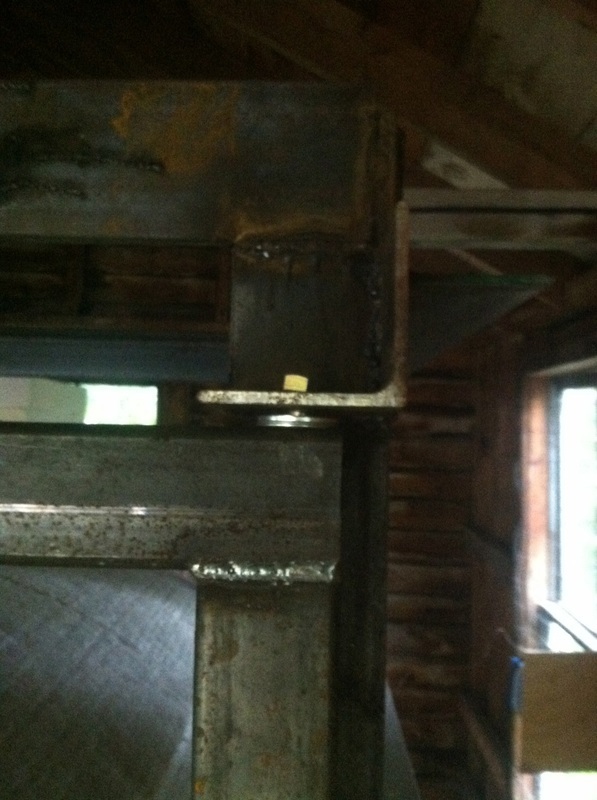 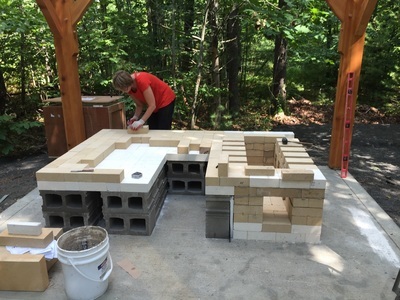 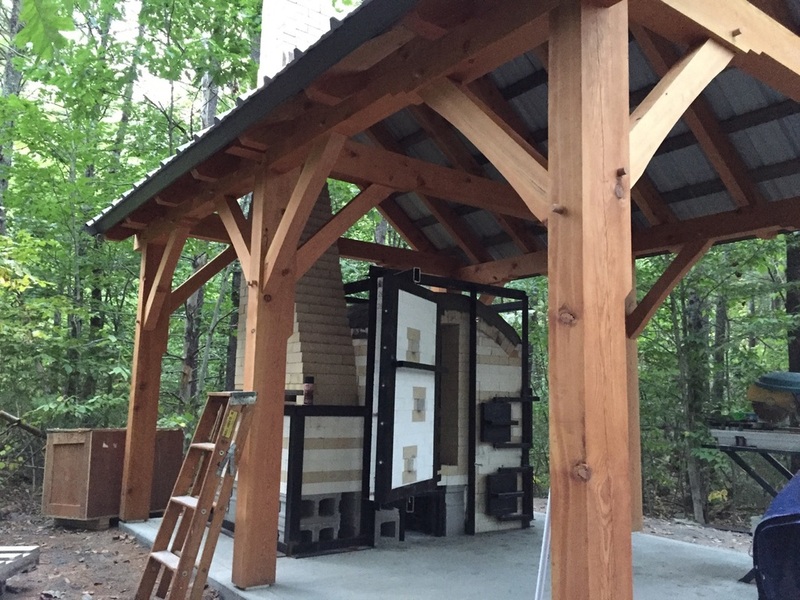 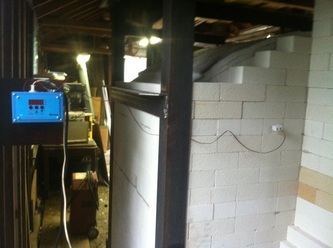 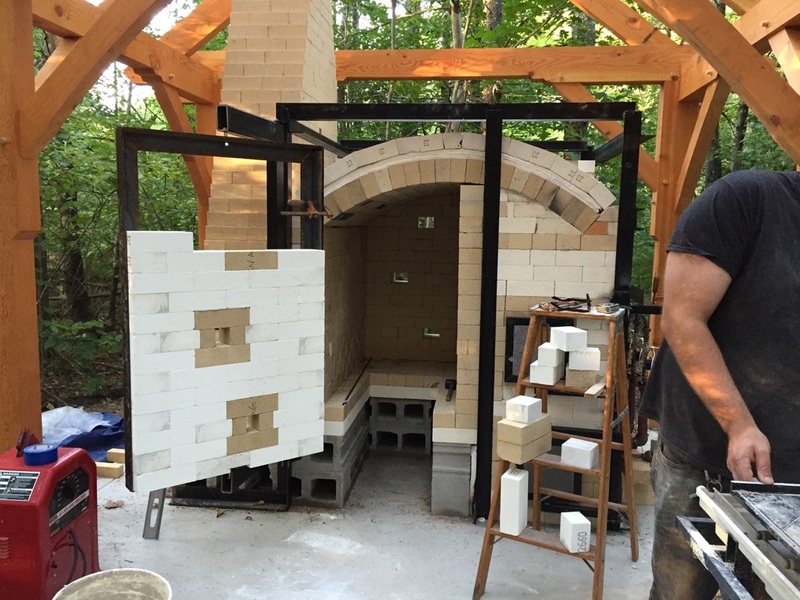 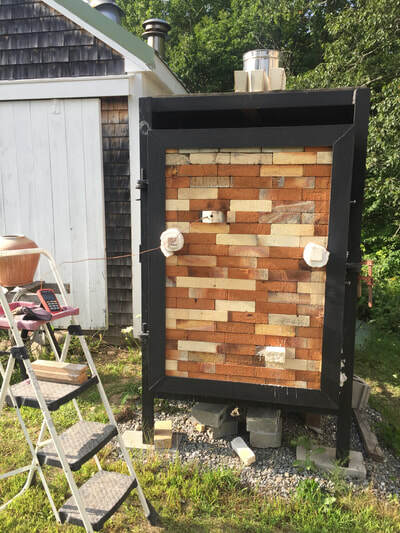 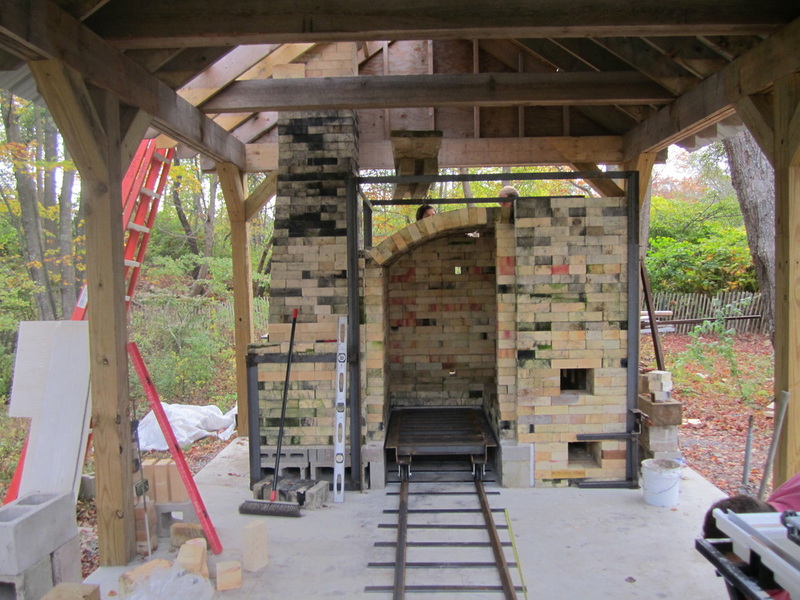 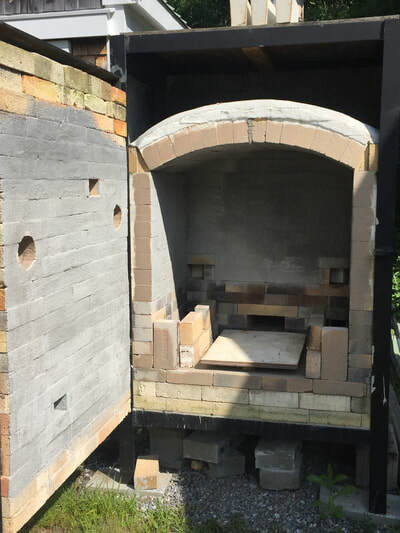 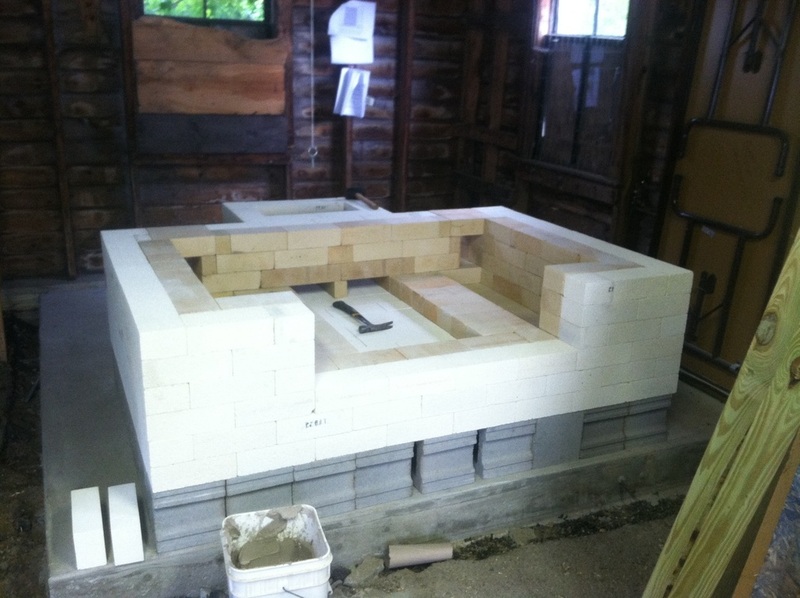 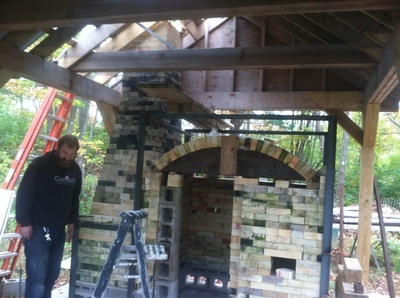 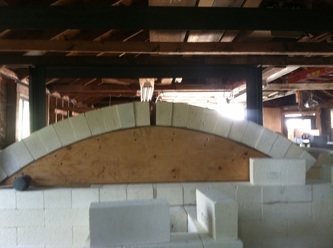 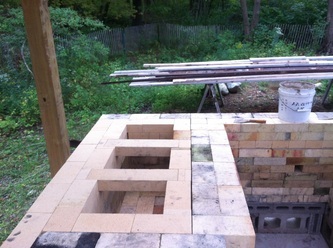 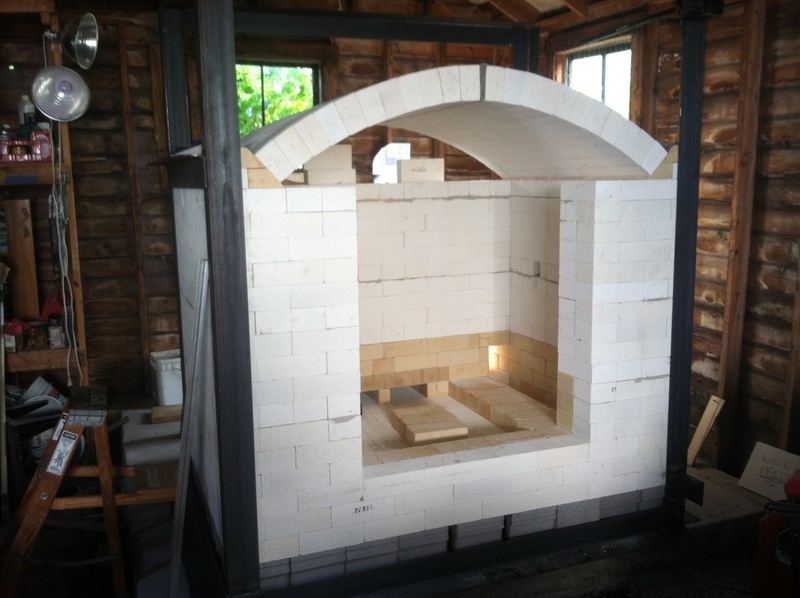 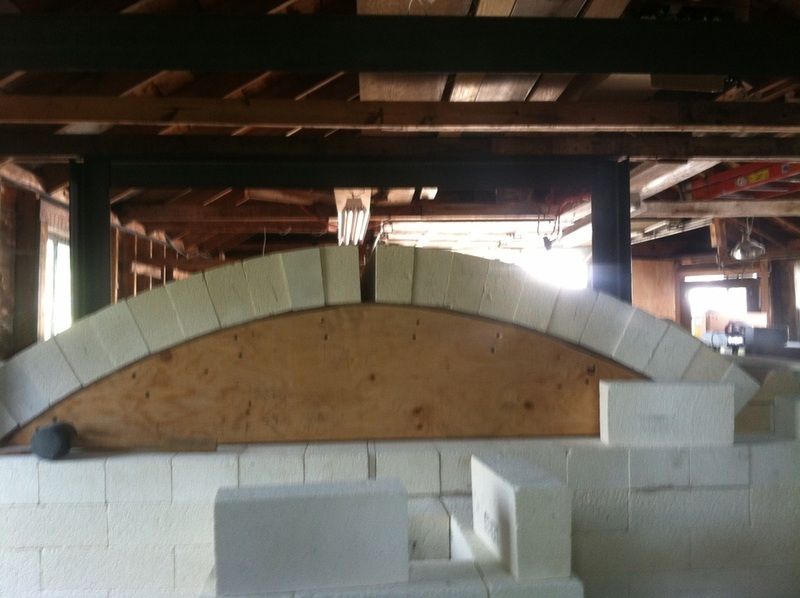 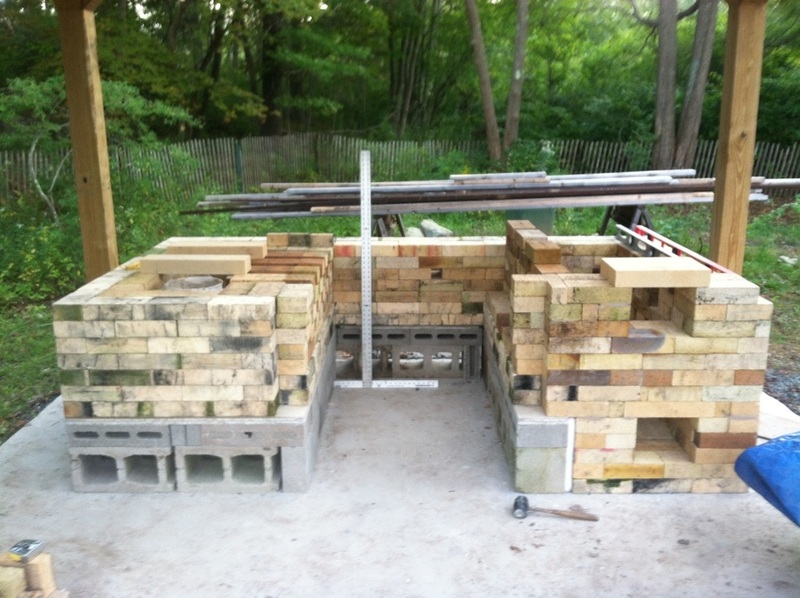 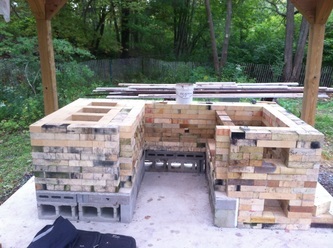 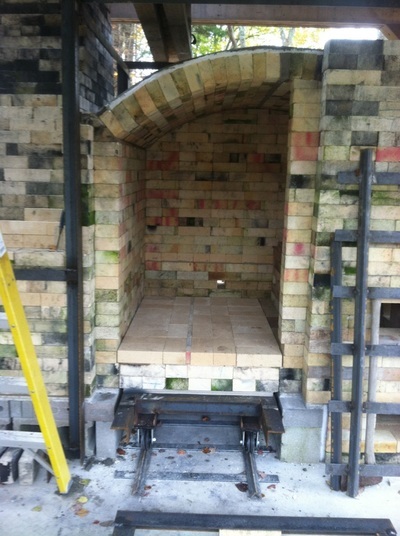 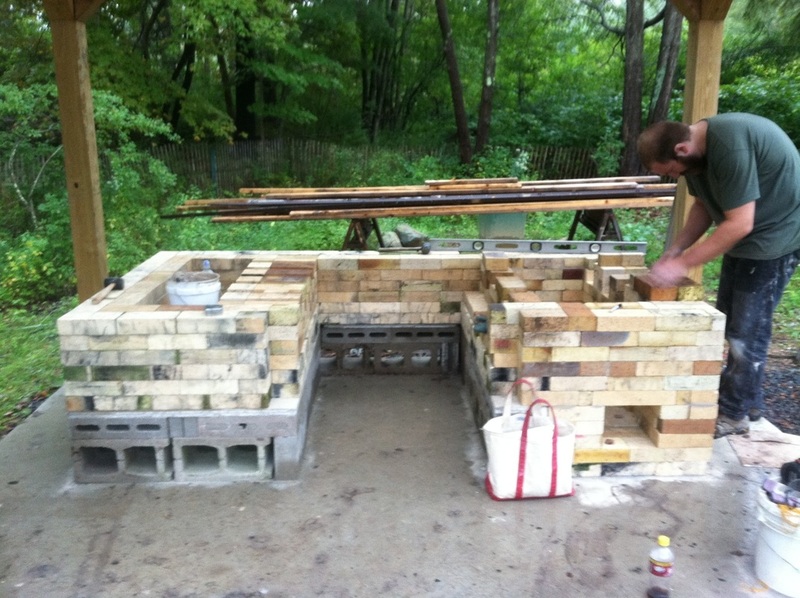 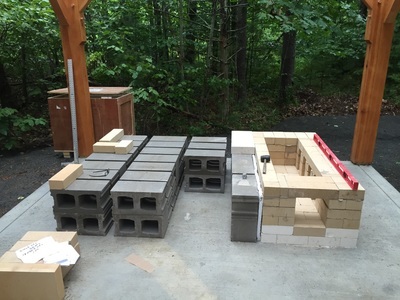 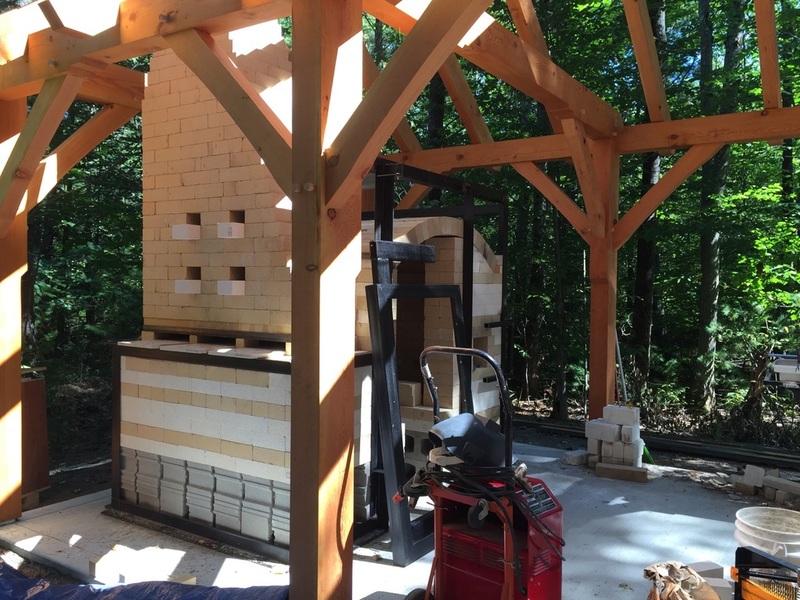 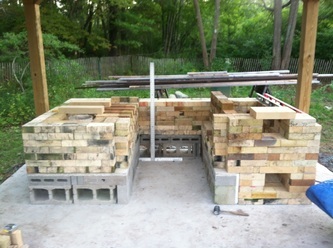 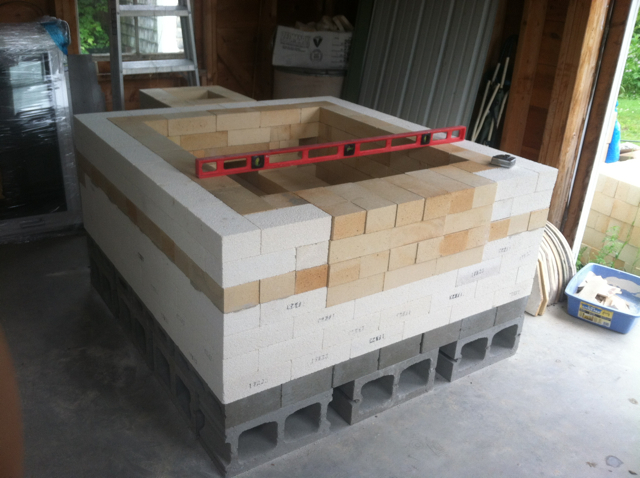 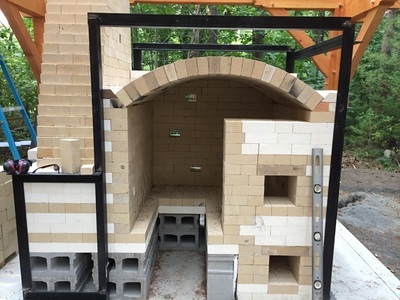 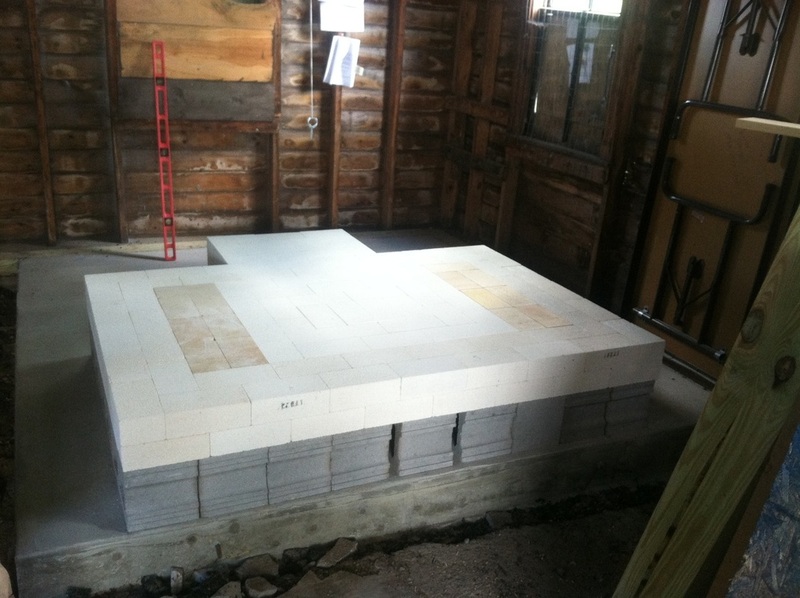 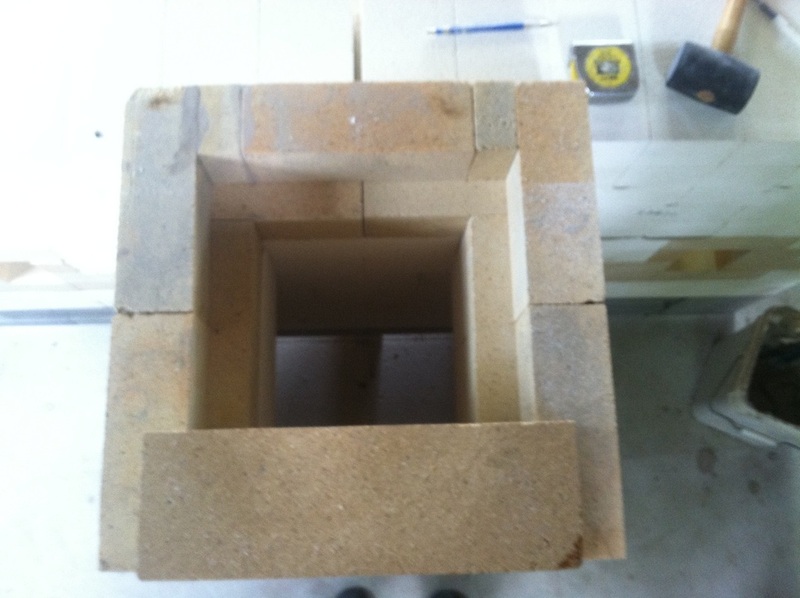 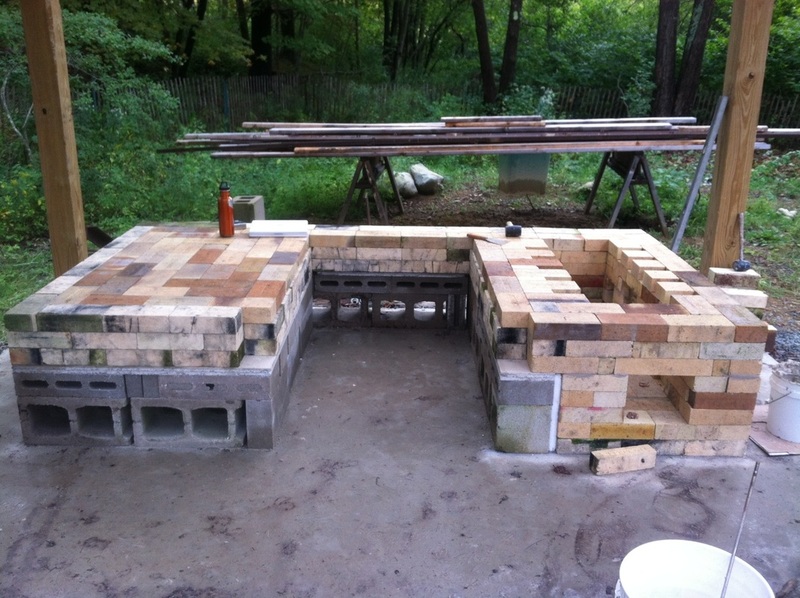 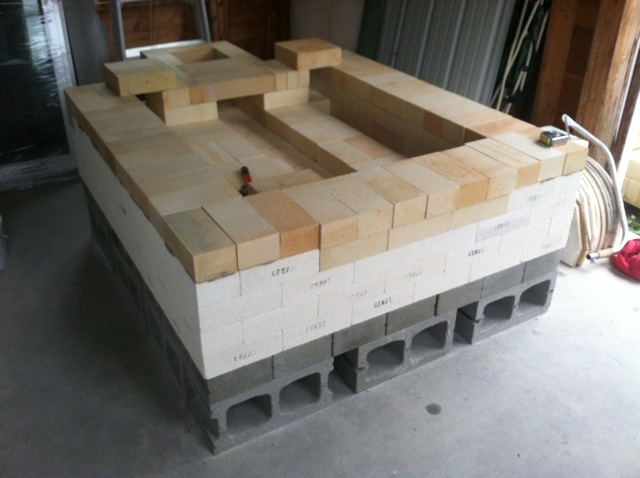 This project was a rehab of an insulating brick crossdraft kiln fired with gas and wood. 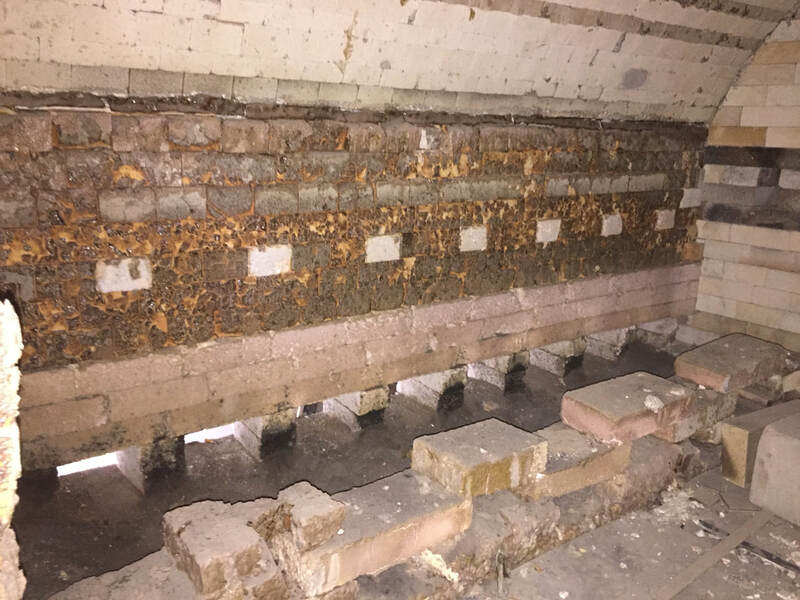 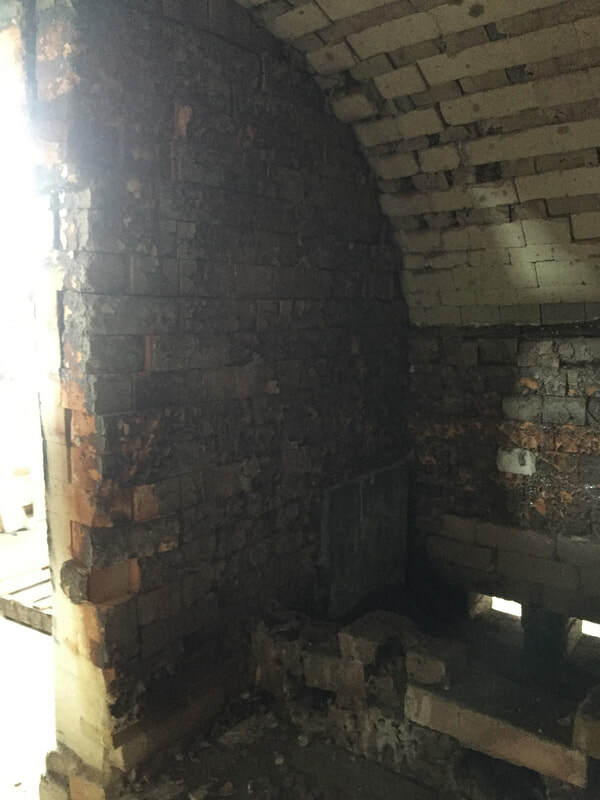 Deterioration from exposure to the wood atmosphere was most pronounced around the firebox and flue exits (some previous relaying of brick was also noticeable at the back wall) The front wall had shifted substantially and required tearing it out and rebuilding. The car was relaid and the door frame extended to provide better anchoring of the door brick. 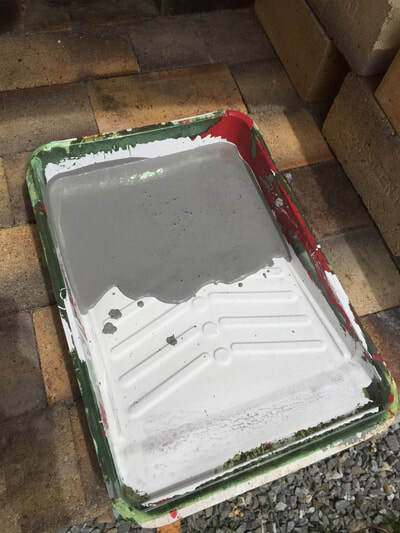 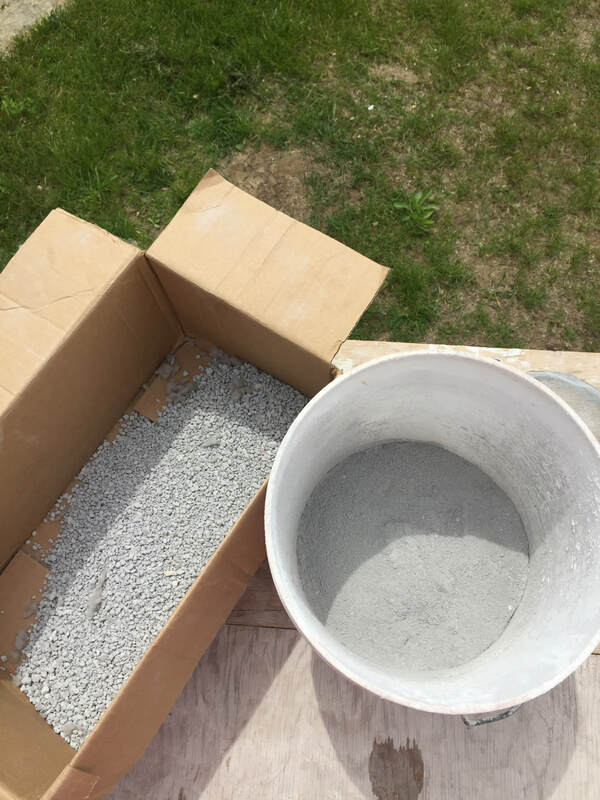 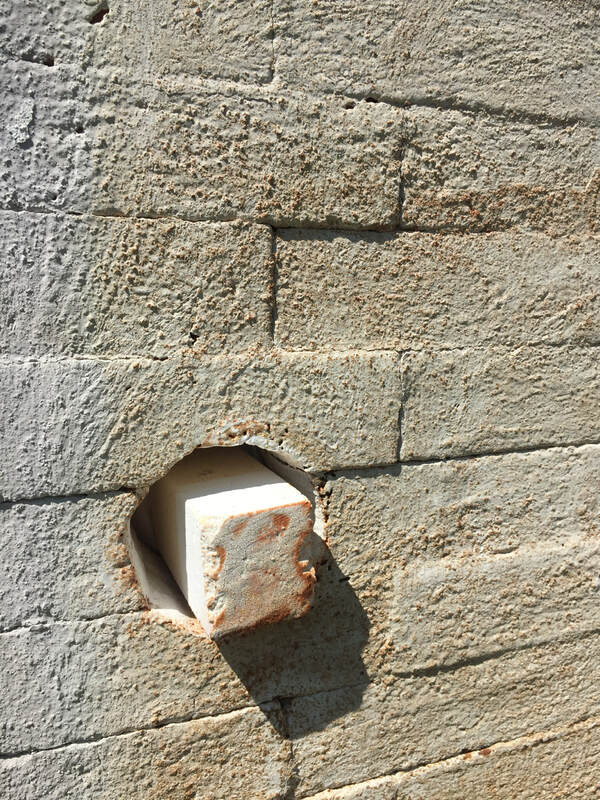 Deteriorated brick was scraped free of loose/glazed surface and recoated with a stucco-like coating of high alumina castable. 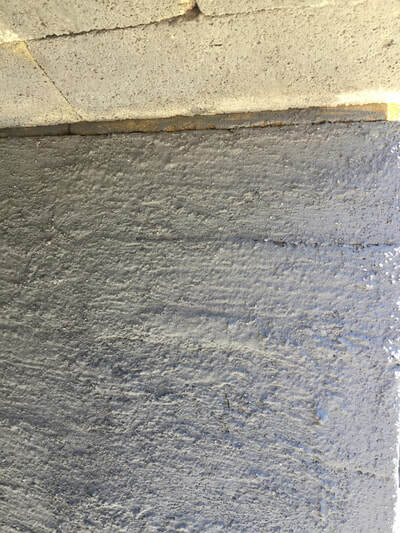 The coating is holding up well, though many more firings will tell. 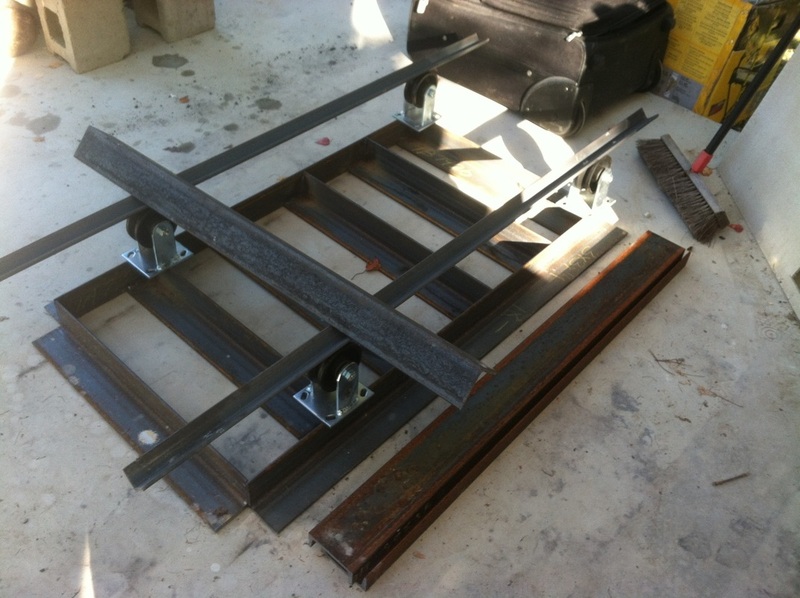 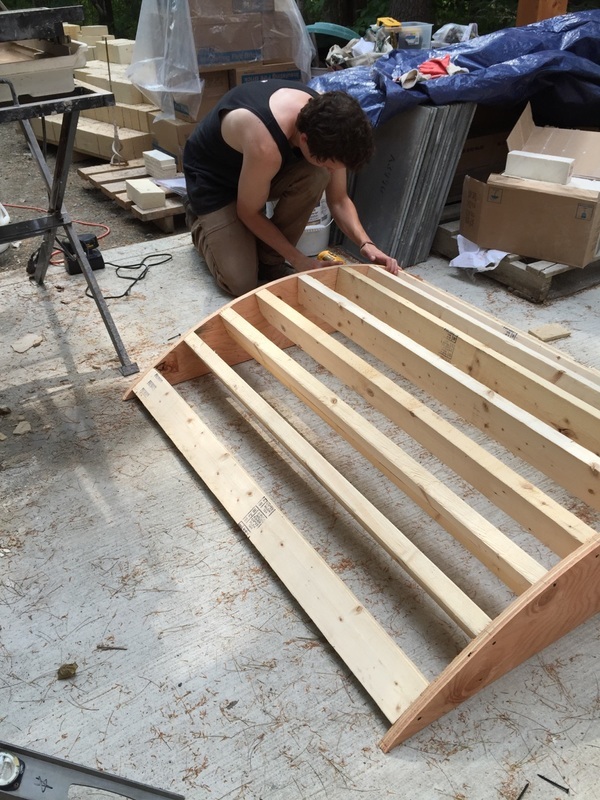 This design is a gas/wood hybrid constructed in 2015. 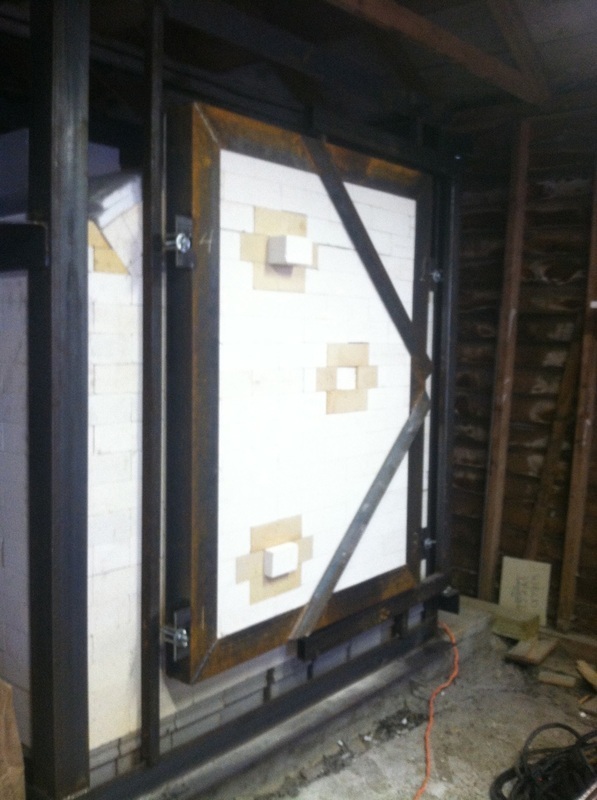 This design includes a roll-out floor to allow for easy reach/loading of the back shelf and a swing door closure. 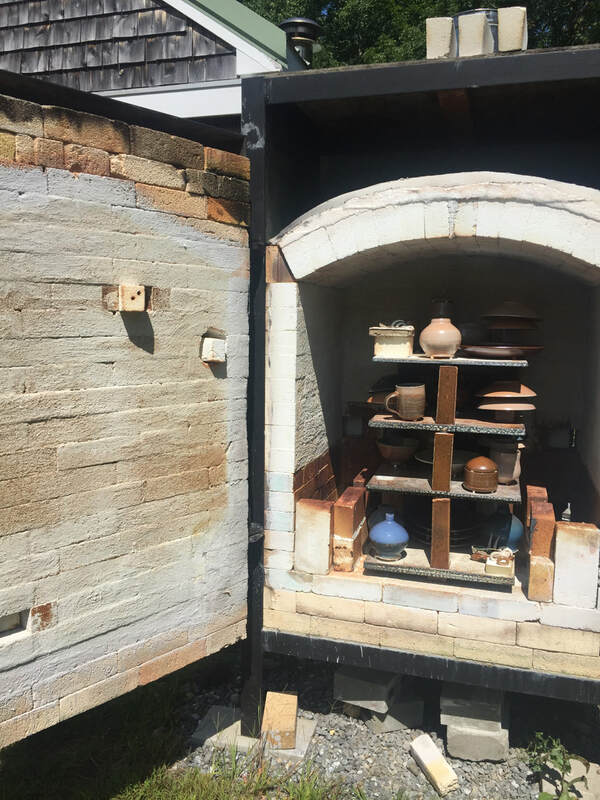 Fired twice in the month following its completion, it performed well during both a gas only firing and a gas transitioning to wood firing. 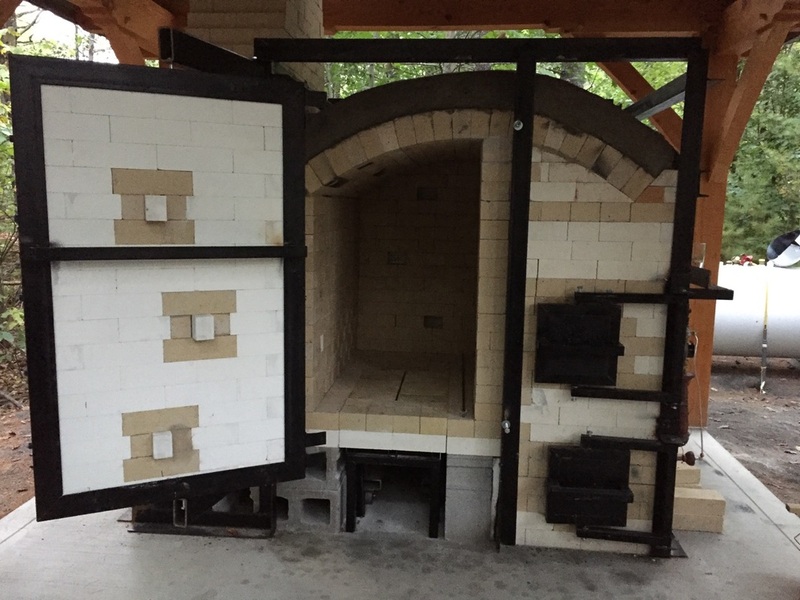 Grad school friend, Rosanne Sniderman, and I worked through a few versions/sizes before settling on this 75cuft car kiln. 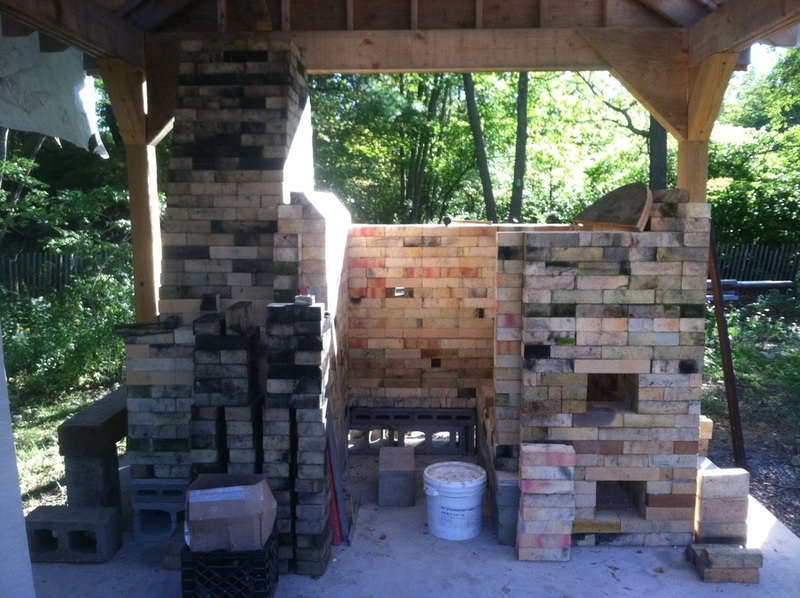 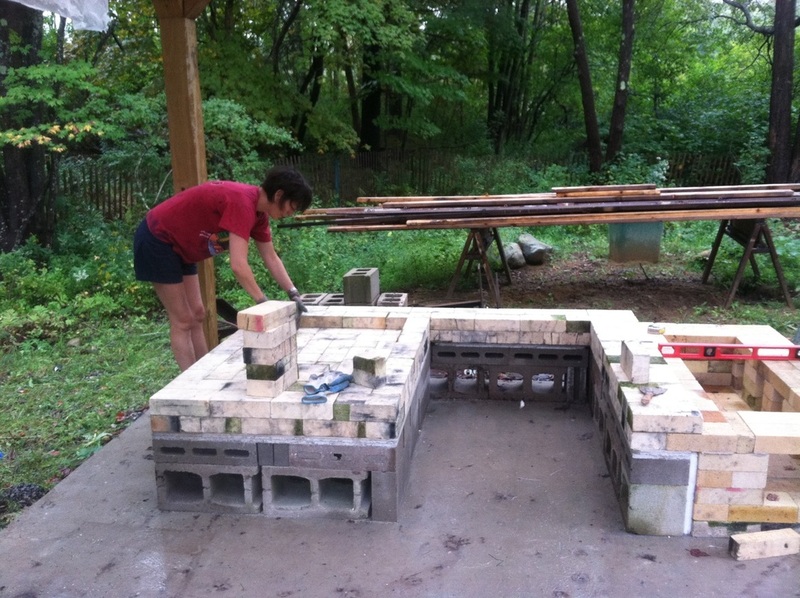 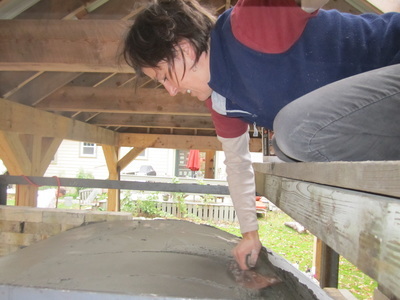 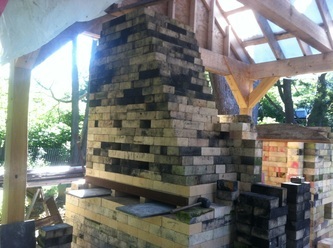 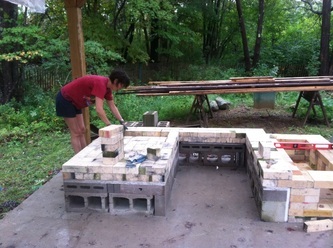 York, ME potter Amy Clark had 7 pallets of brick from a kiln she dismantled and moved from upstate NY. 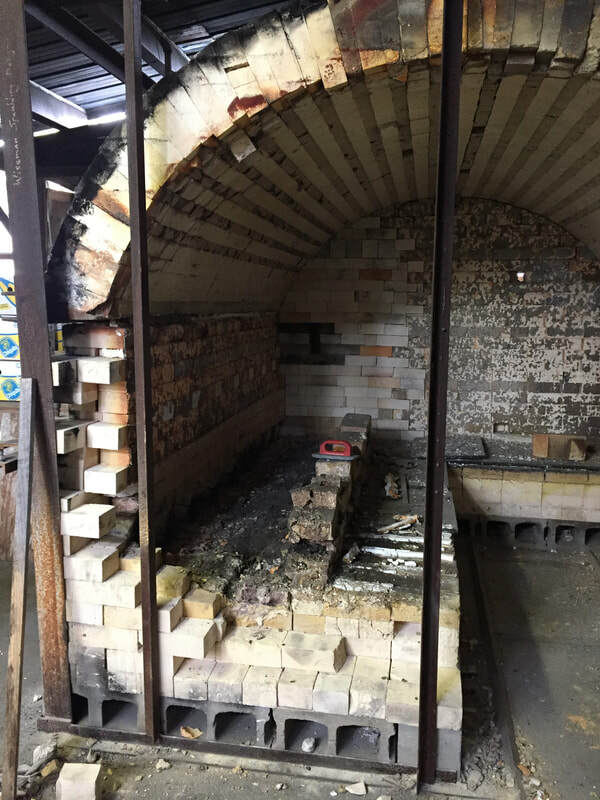 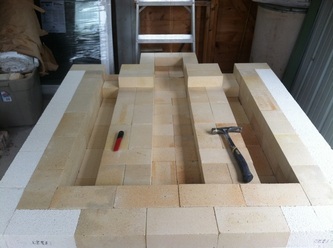 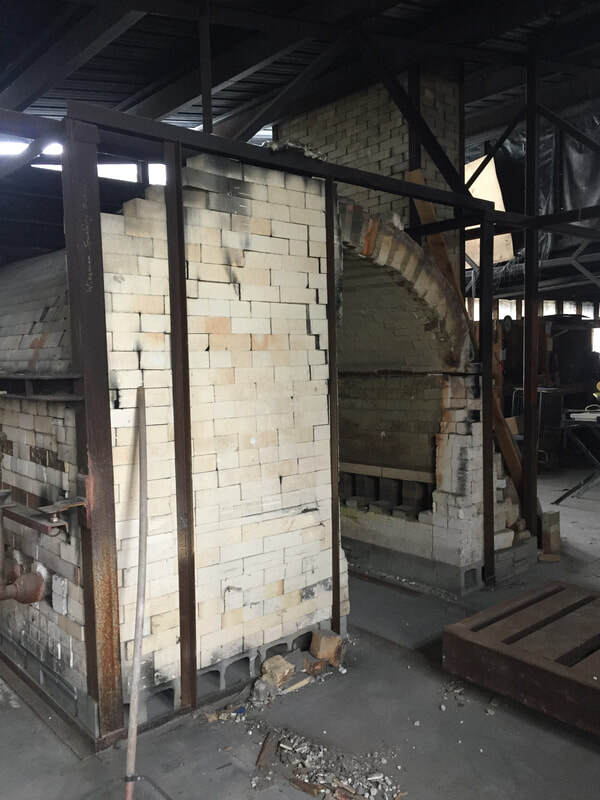 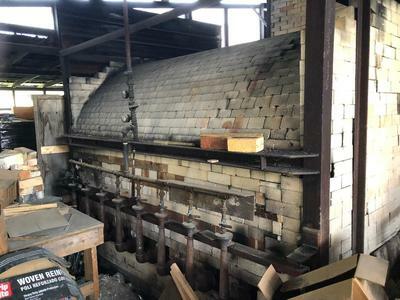 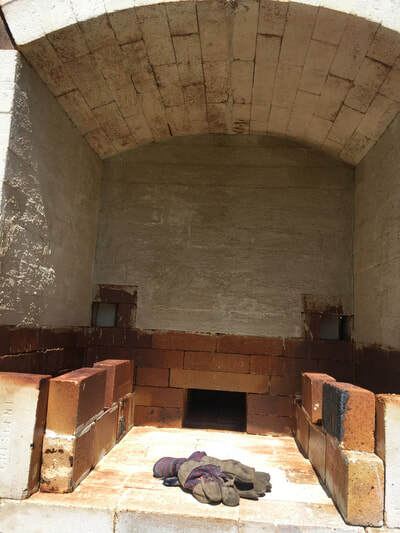 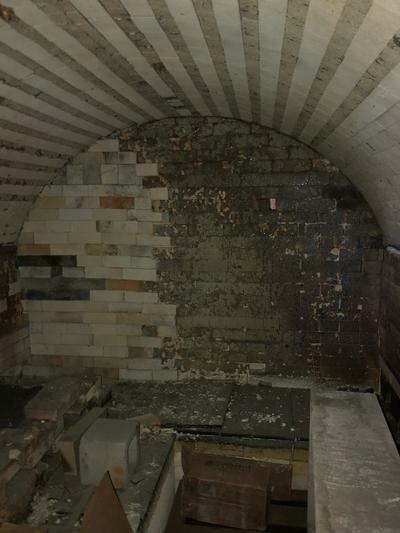 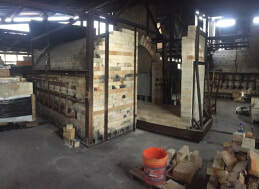 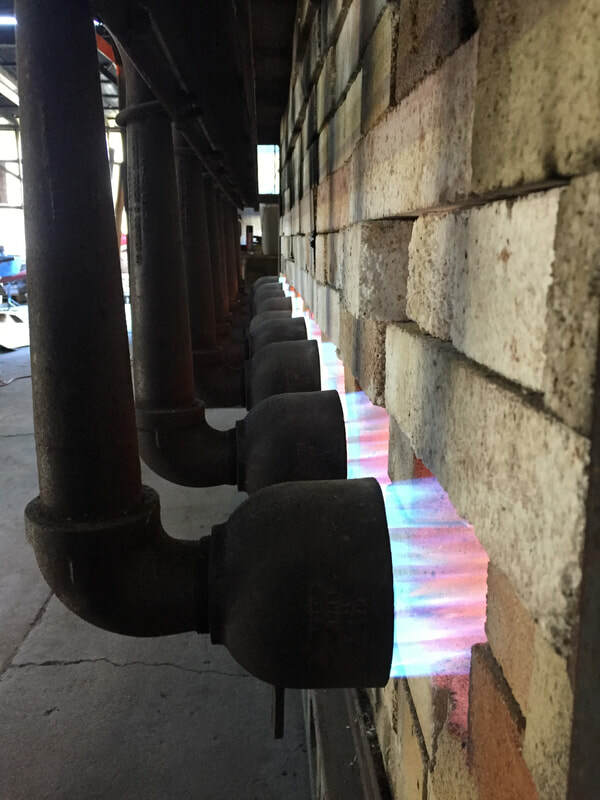 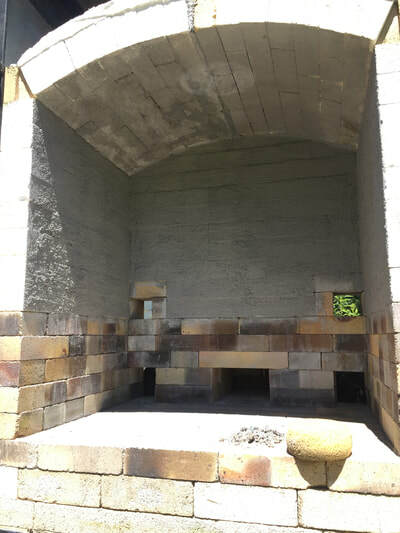 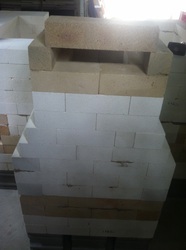 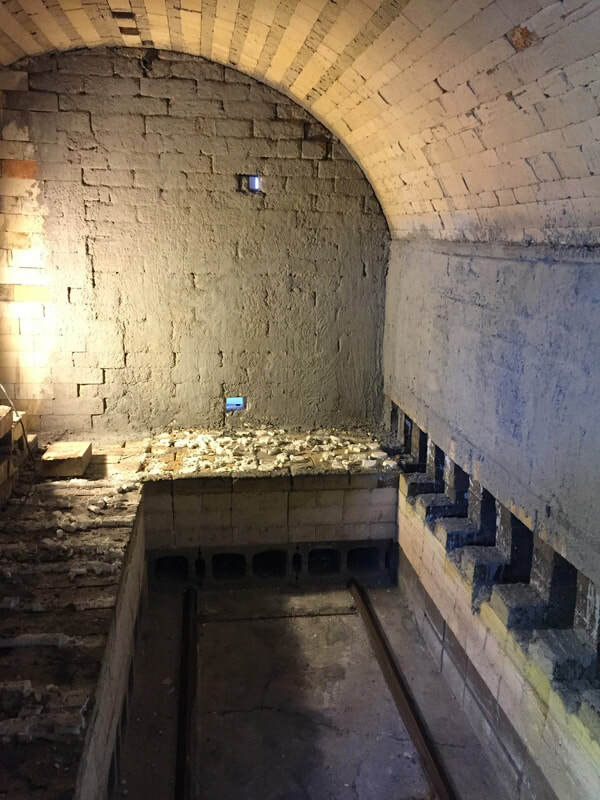 Original kiln was a large 6 burner downdraft walk-in. New design is a crossdraft sprung arch, adds a kiln car, and features that allow Amy to fire with wood, or propane, or both! 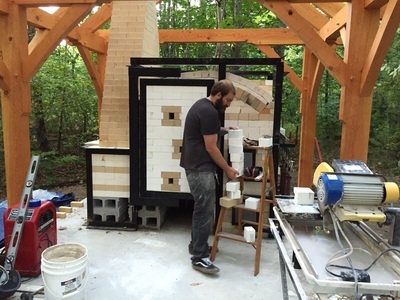 Cait Guinta and Ned Roche opened Chases Garage Artist Studios and Gallery in York, Maine in May 2013. 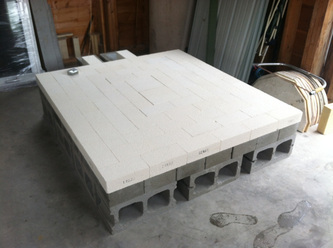 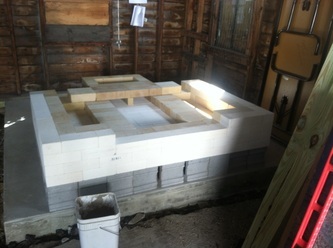 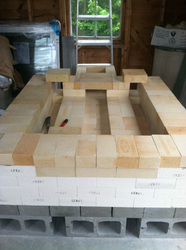 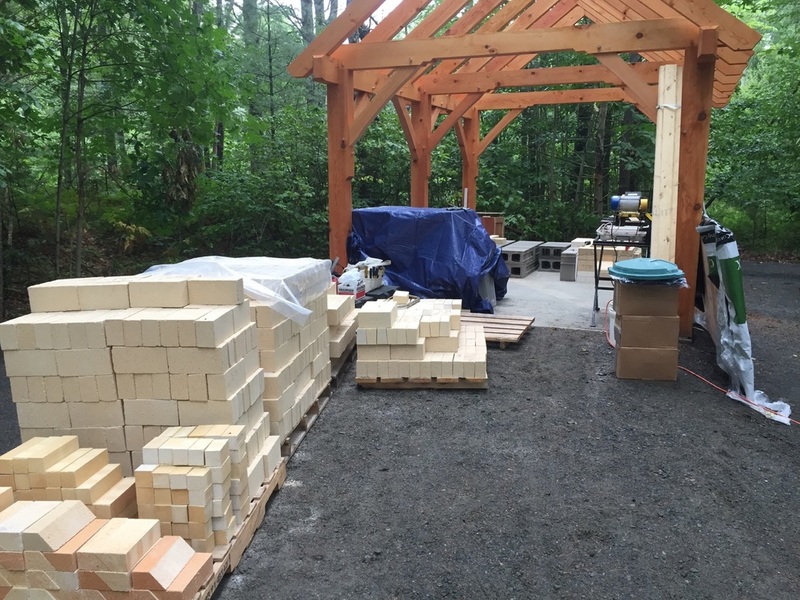 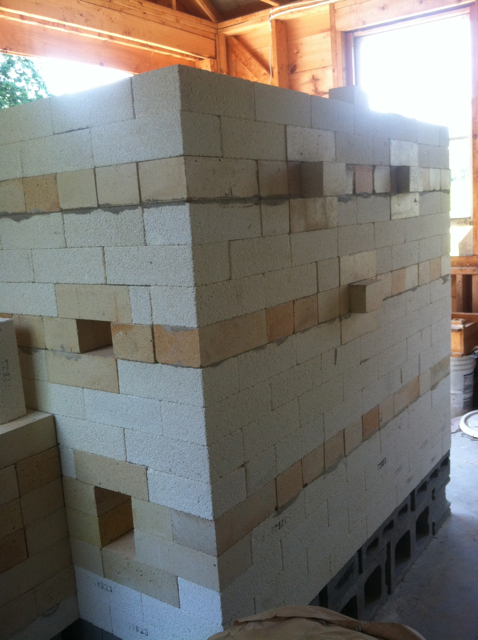 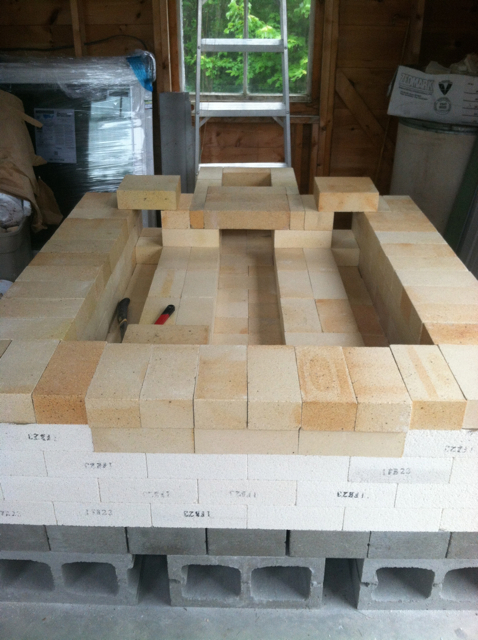 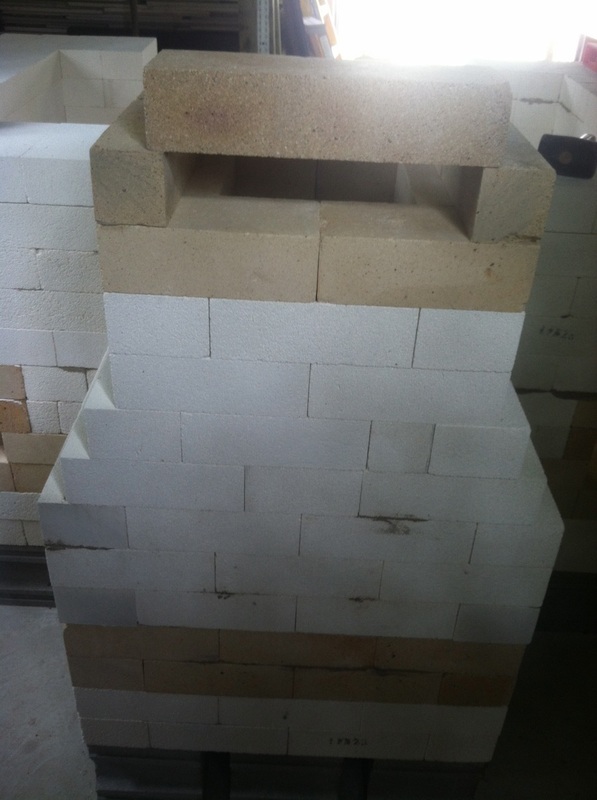 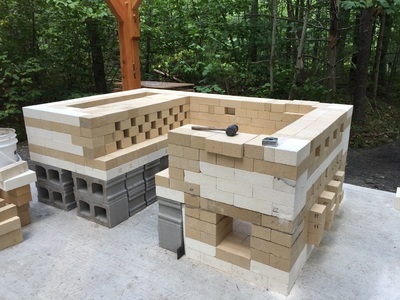 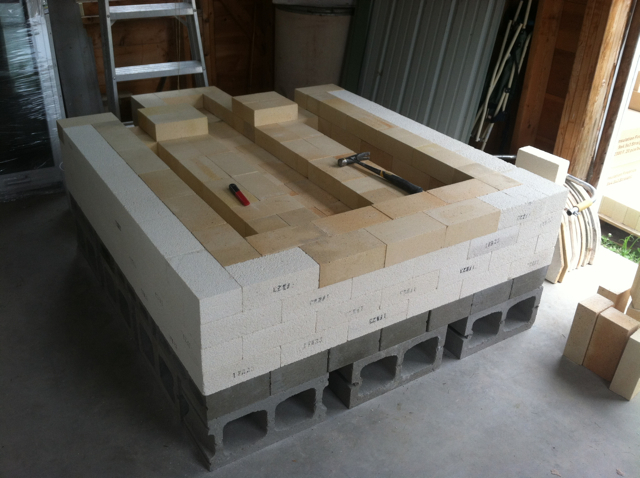 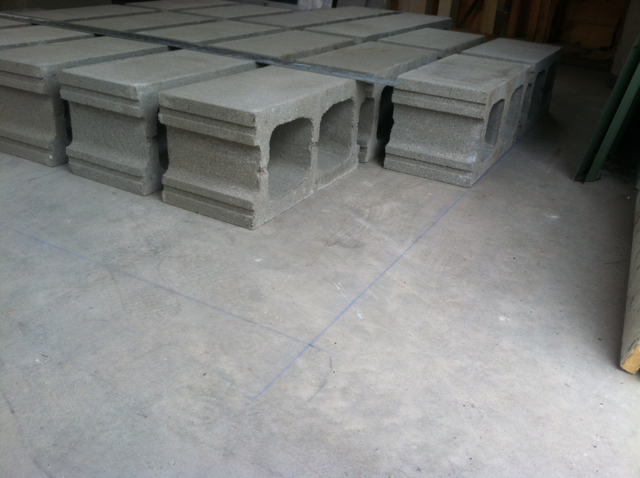 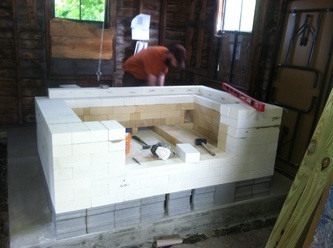 Construction of a propane fired 30 cuft (45 cuft total) downdraft insulating brick reduction kiln began in June. 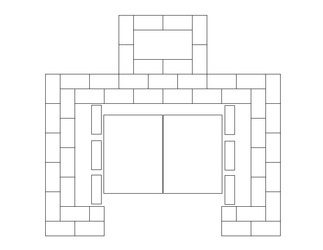 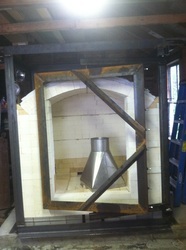 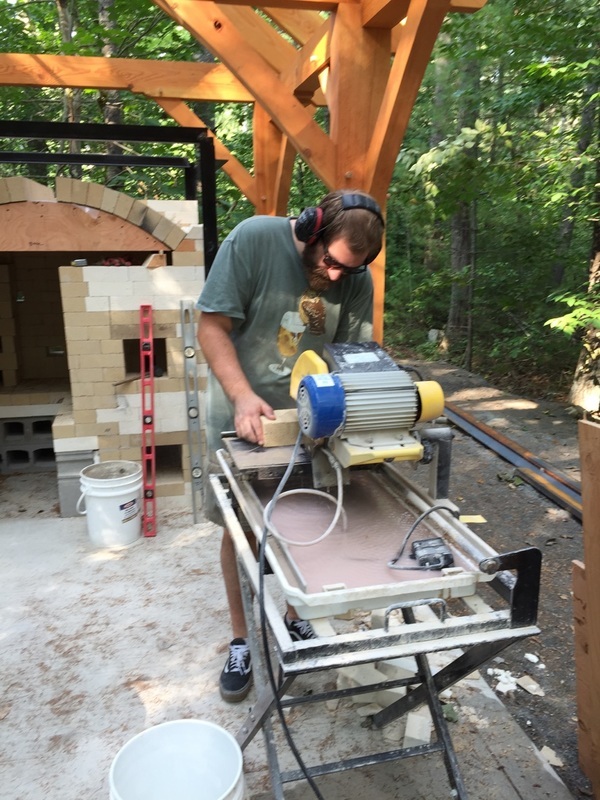 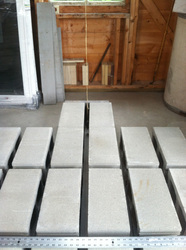 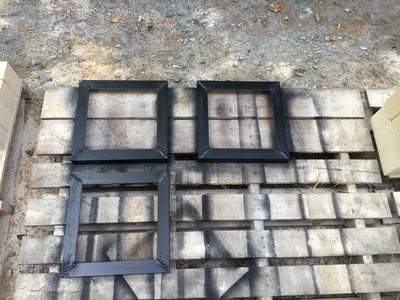 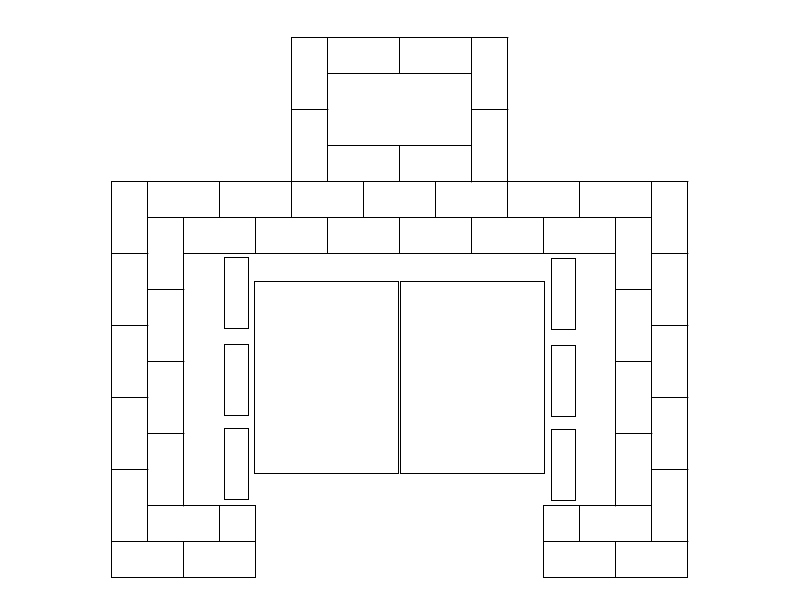 A double pivot door makes closing up the kiln a cinch. 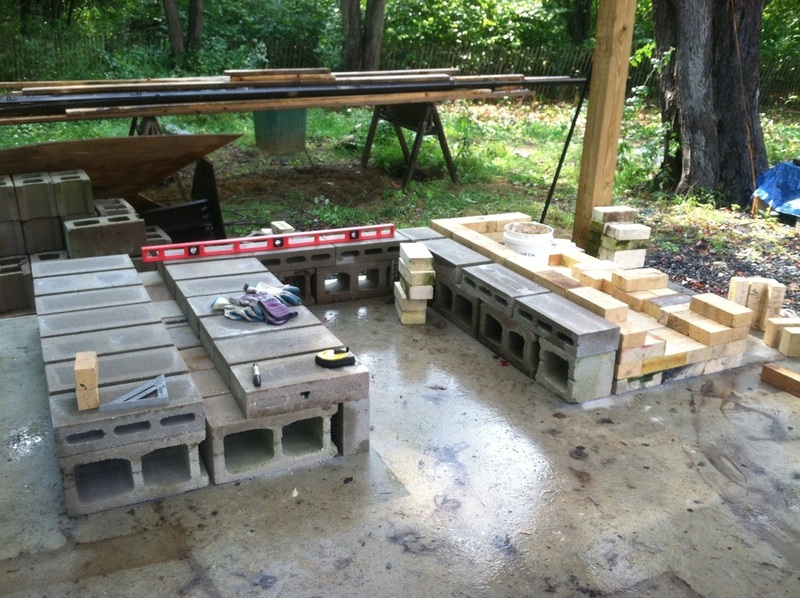 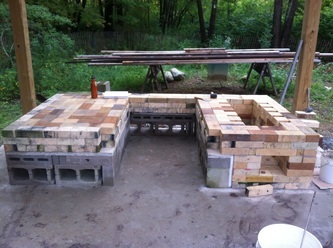 Seven days of building and the structure was complete. Special thanks to Ned for his help with the build, and Phil for his welding expertise. 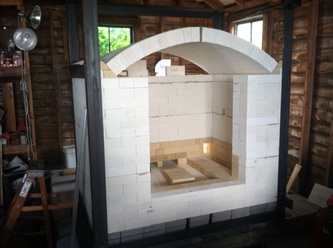 Burners mounted and plumbed in August with first firing of the kiln September 5.